Miaow on the beach wearing the the big beachy hoody Jane made for her. 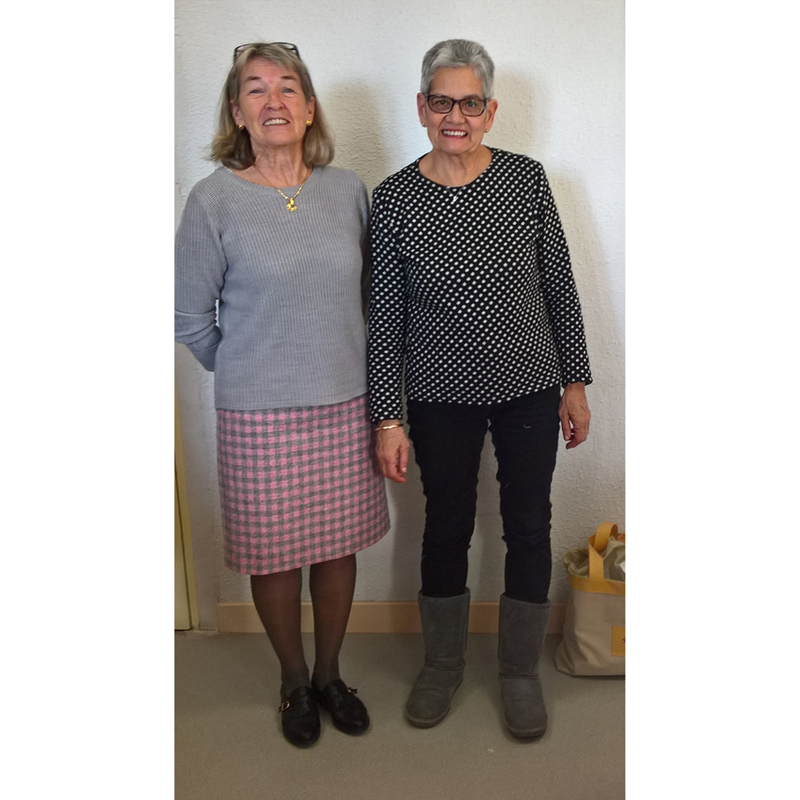 The pattern is McCall’s 7044 (Jane extended the length). 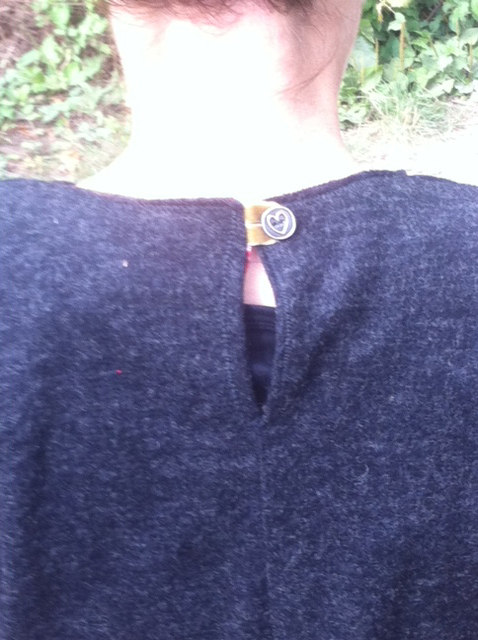 A twin needle was used for the hems, all the seams were done in a jiffy on the overlocker. 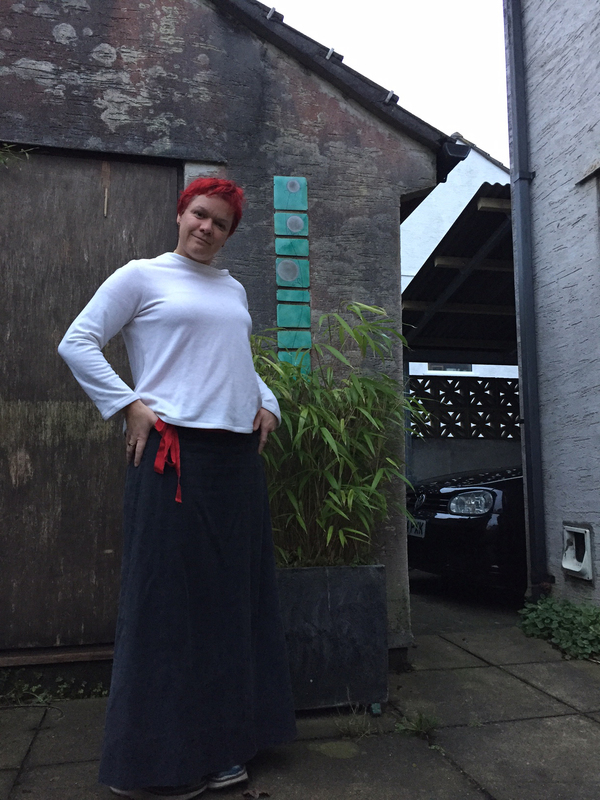 Kitcat (age 11) made this viscose jersey skirt more or less all by herself. We would say she is clever but don’t want to be accused of favouritism . 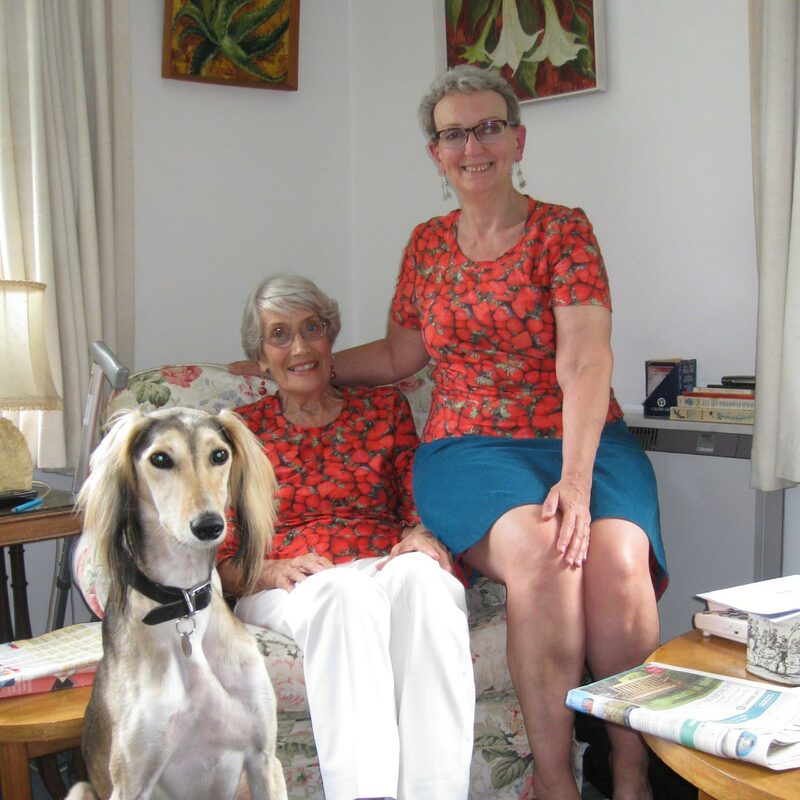 This is Rachel and Rachel wearing their matching strawberry print cotton and elastane jersey t-shirts along with wolfy the dog (whippet the whippet was locked outside after rolling in fox excrement). 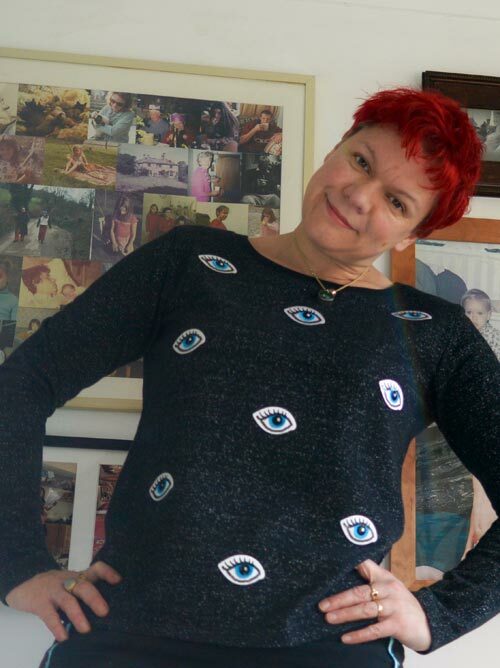 Bess embellished this simple black sweatshirt with iron-on eye patches, she intends to sew them on but so far (6 months down the line) they are mostly still attached so in the name of indolence she hasn’t done it yet. She will. Honest. 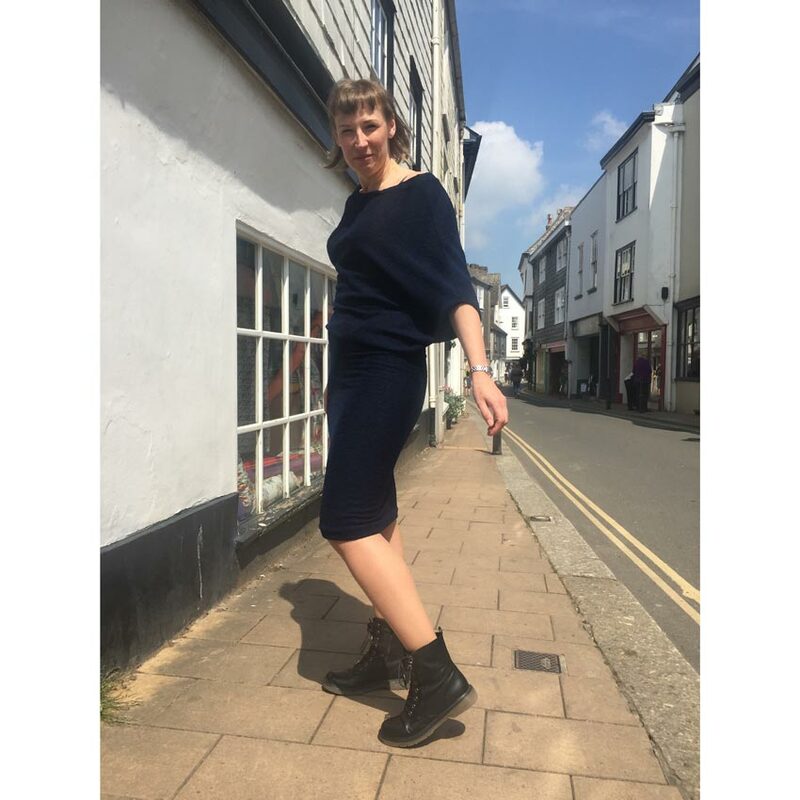 Julie made up this super jacquard jersey into a three quarter sleeve dress and is really pleased with it (as are we!). 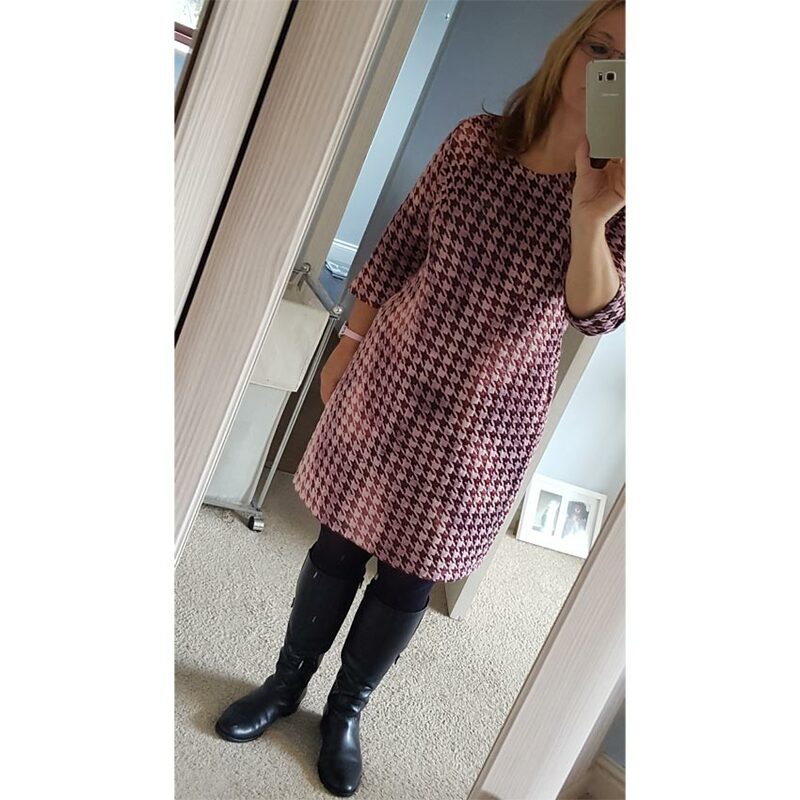 The pattern is self drafted and works brilliantly with this stable jersey that behaves much like a ponte roma jersey does (although this is a lighter/looser weave). 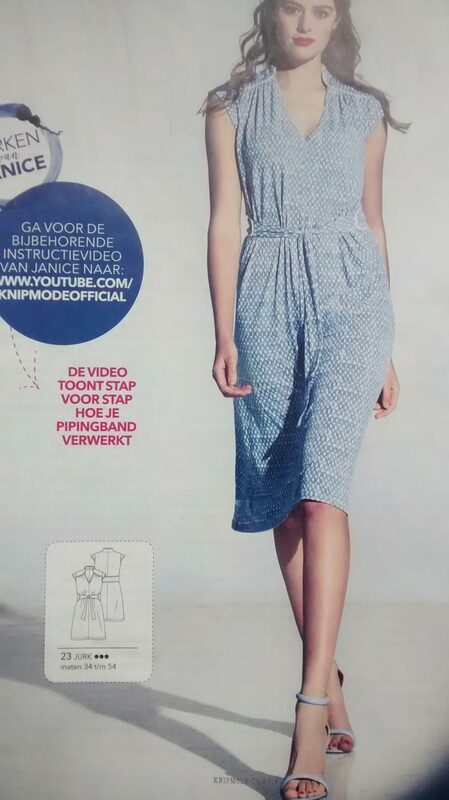 Daiga sent us this the details of the Knip Mode dress she was planning to make enquiring if the blue crepe viscose jersey she liked was suitable. I think the answer is a resounding YES, definitely! 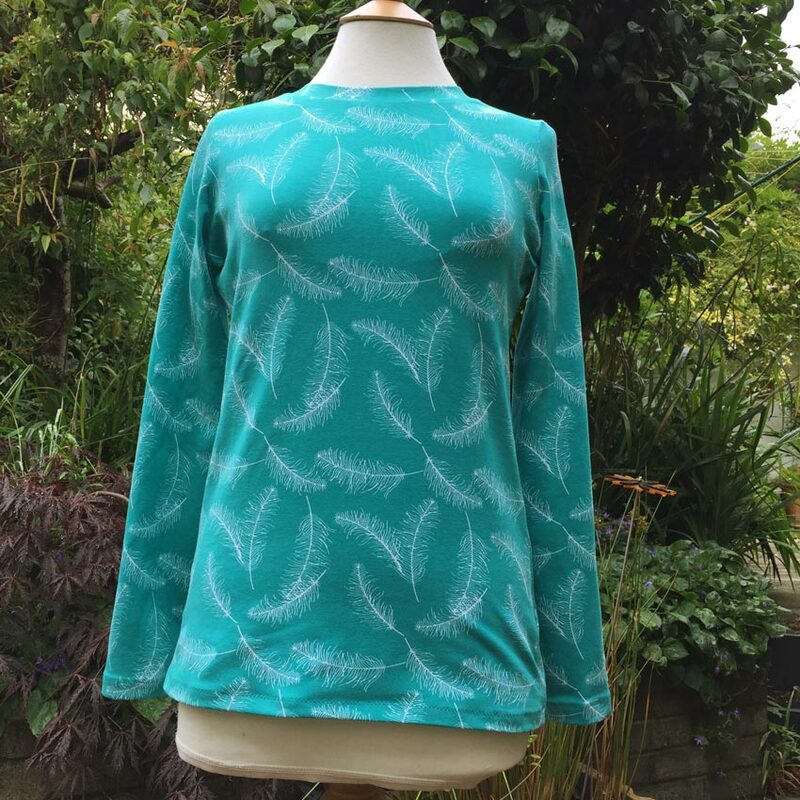 Bess made up this feather print T-Shirt for her little sister using lovely stable Cotton and Elastane Jersey with lots of stretch that makes the binding on the neck a cinch. Plus there is the added bonus that as the fabric is so wide and Lulu is such a squinge Bess can make up the entire thing out of 80cm. Bonus! The hems are done with a simple zigzag because Bess hates the coverstitch machine. 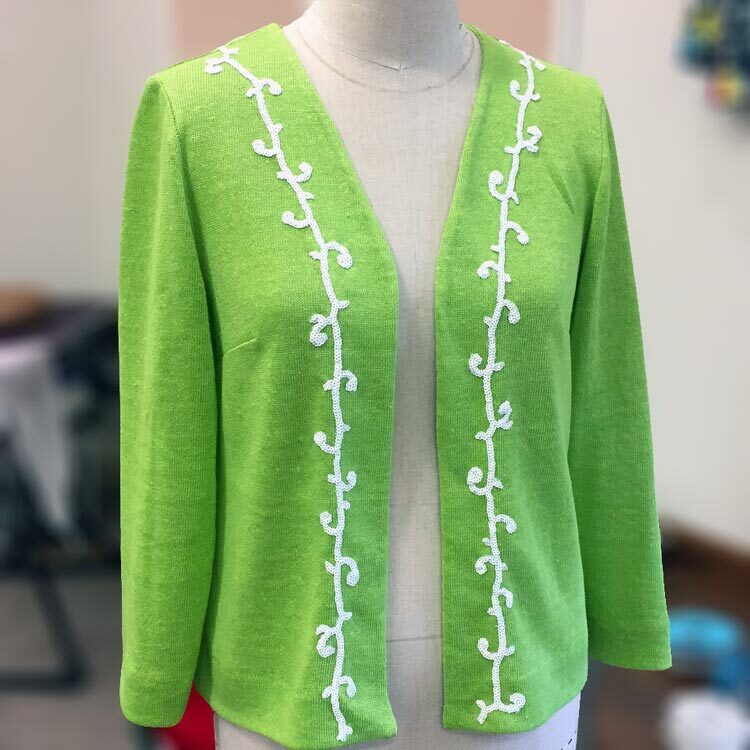 Bess made this green linen jersey cardigan purely because she needed an excuse to use the fantastic scroll sequin trim. This trim is not confined to cardigans, and whilst it may look like it is a pig to attach it really wasn’t (Bess sewed it by hand). 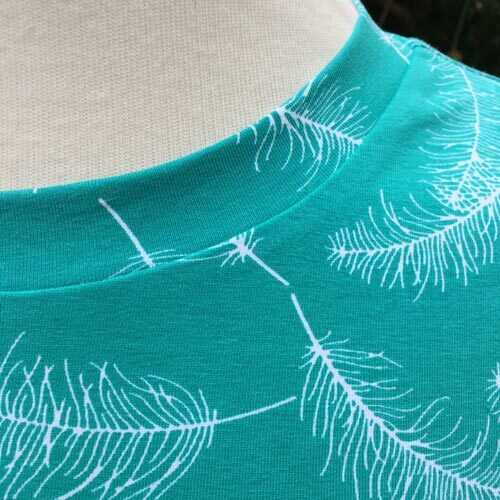 The pattern is a basic t-shirt pattern with bust darts that Bess cut open with a V at the neck. 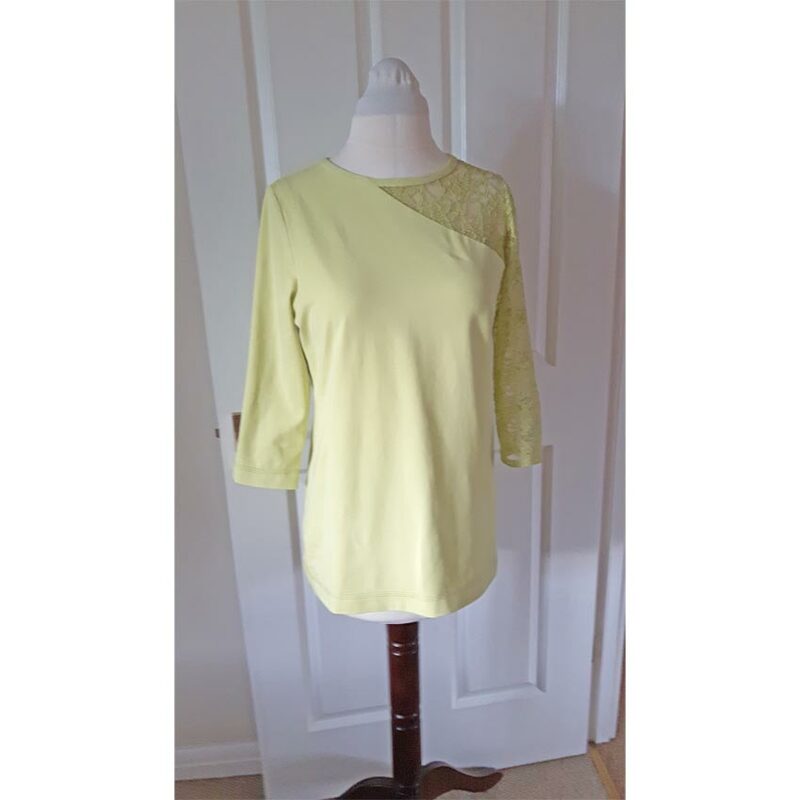 Jane B made this fresh and lovely spring green cotton jersey top with lace inset on the shoulder. 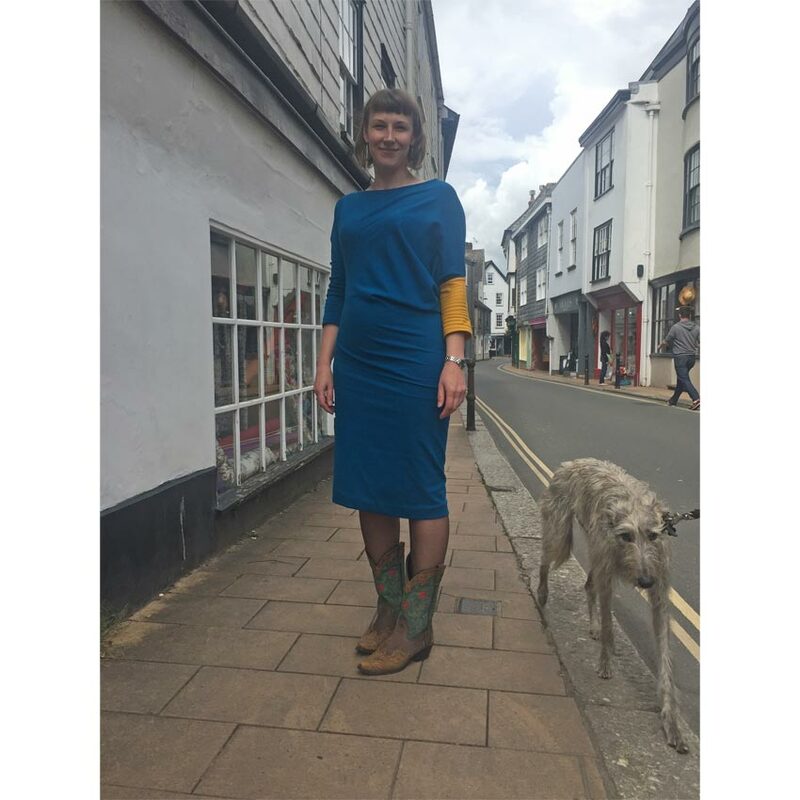 Aiste self-drafted this dress and made it up in ponte jersey with yellow contrast asymmetric sleeves. 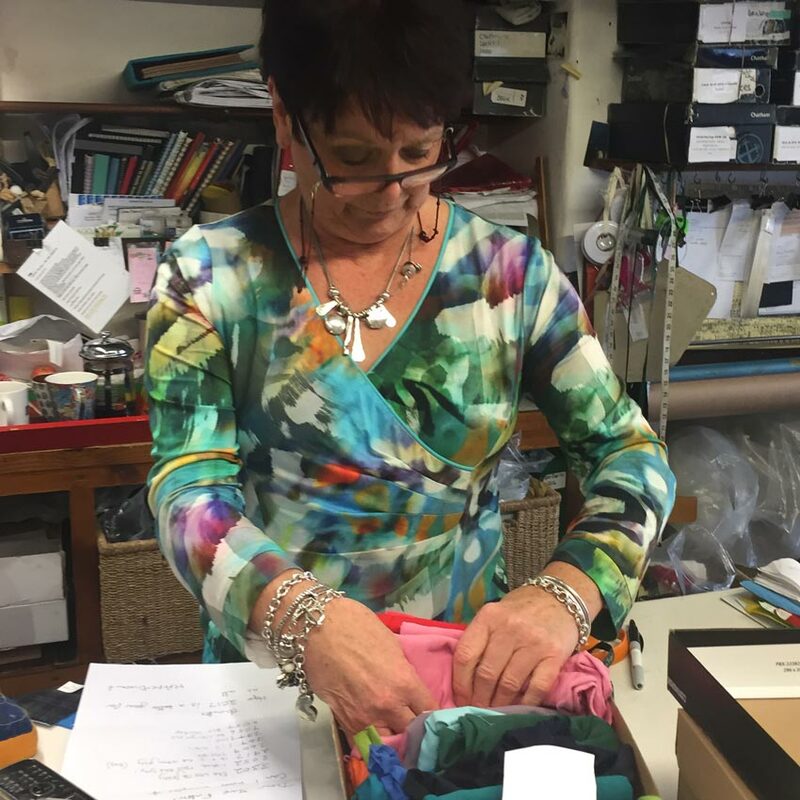 Jane busy sampling wearing her digital print viscose jersey mock wrap t-shirt made by Bess. 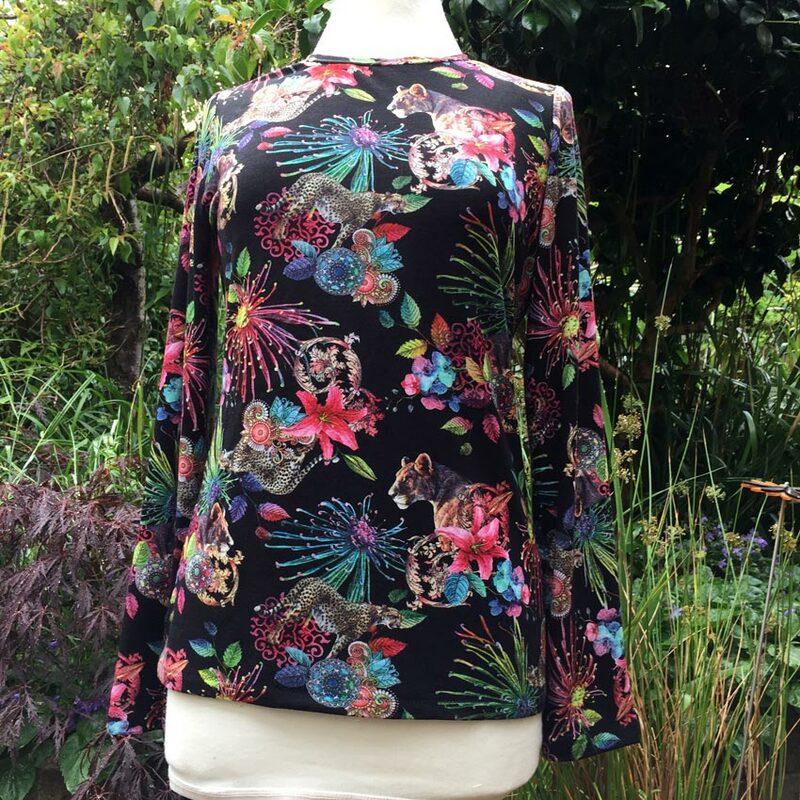 The Pattern is Kay Unger for Vogue V1519 which has a cap sleeve, Bess used the sleeve off another top (that just so conveniently fitted) so as to have a longer one. As it was quite a complicated design and tricky to see the sizing so Bess made a toile first in cheaper jersey. 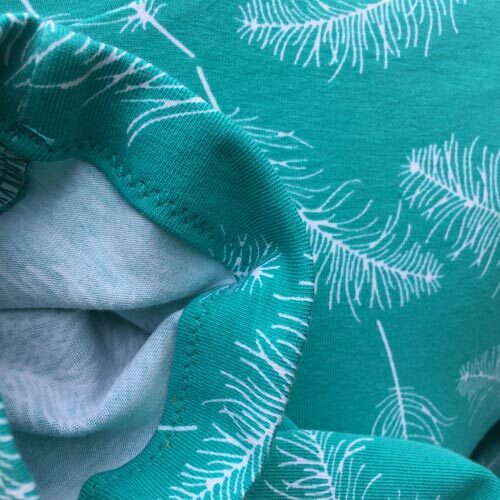 The wrap part is lined in viscose jersey and Bess used turquoise stretch piping on the neck to keep the tension and shape. 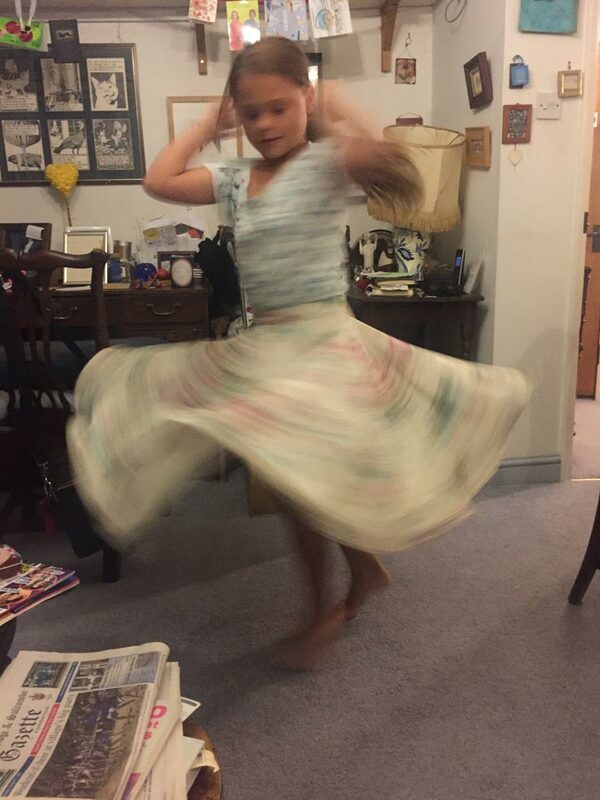 There were lots of pleats and tucks that were carefully marked, and whilst Bess truly did intend to follow the instructions she forgot after a while, but it came out okay. Hoorah! 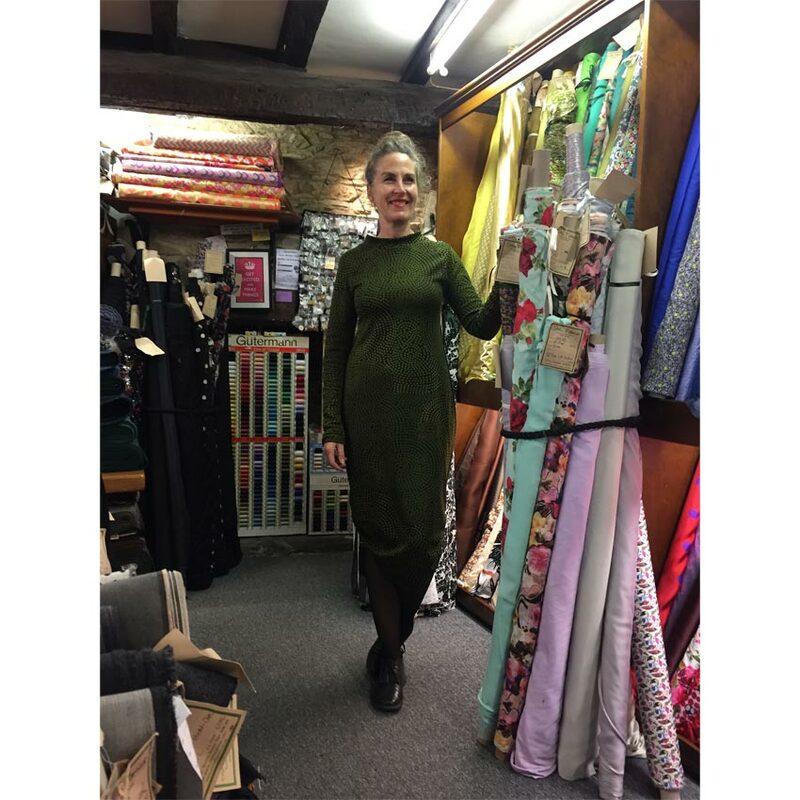 Aiste playing with jersey again here with a jacquard weave heavy wool mix knit. The pattern was taken (and modified) from a purchased top. 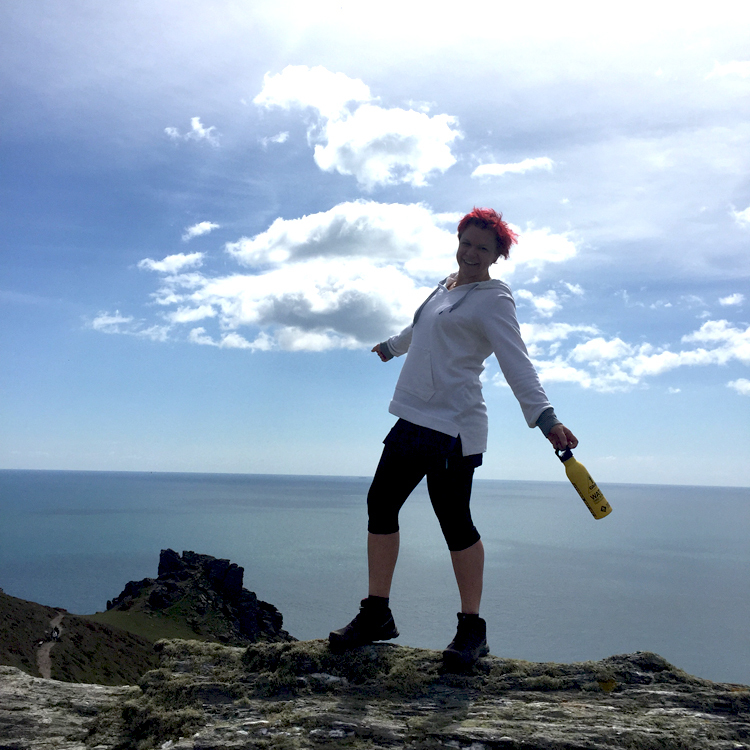 The fit is fabulous – this is why we love jersey! and the asymmetric cut makes it interesting from all angles. Aiste had a moderate case of P.S.F. (phobia of stretchy fabrics) which we said was irrational and she should get over it. So she did. 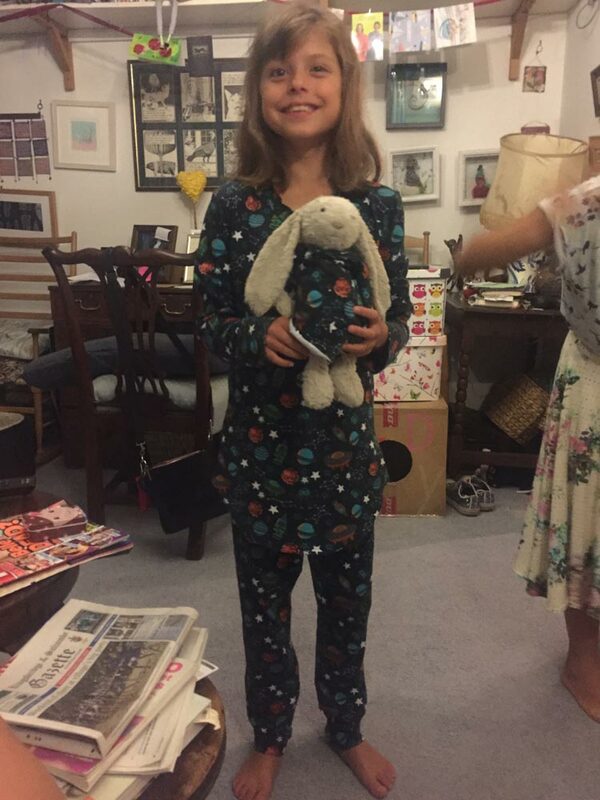 This is her first attempt at sewing jersey – possibly not the easiest of choices but The Girl Did Good, the stitching is beautiful and we think this might be the start of something brilliant. Well done Aiste! 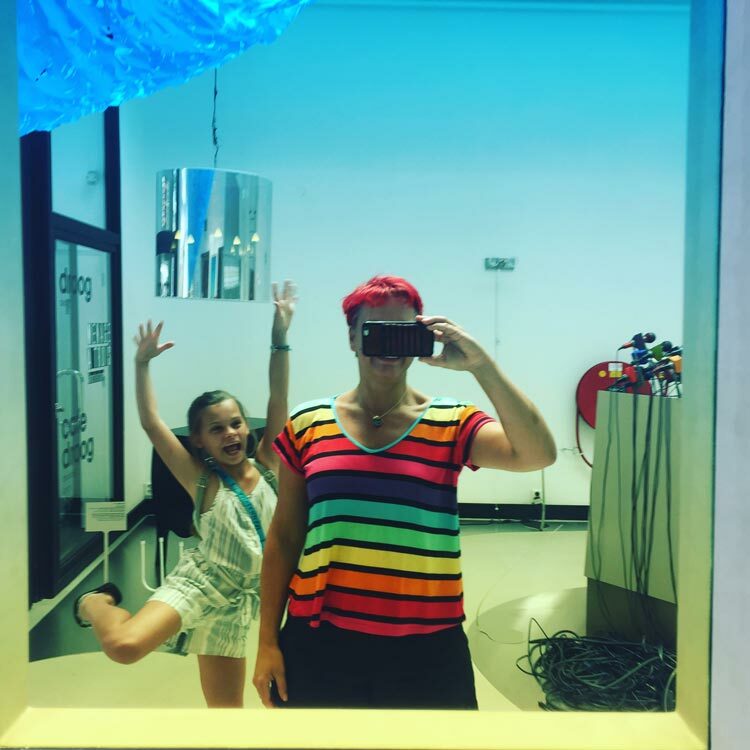 The jersey is a polyester and lycra (fine, slinky and super stretchy) which was possibly not what we recommend to beat P.S.F but the important thing is it is a fabric you really want to sew. 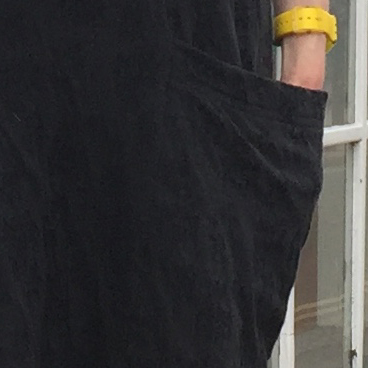 The waist is elasticated. Nice and simple. 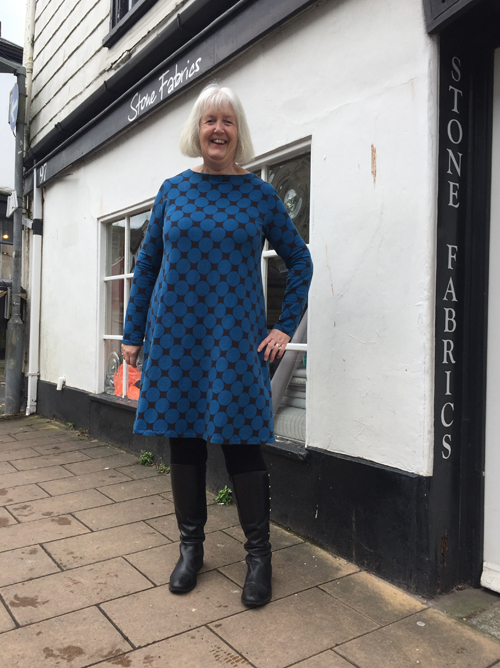 Julie at the Keep on Sewing weekend course wearing her navy blue crepey jersey dress with purple and white geometric print. 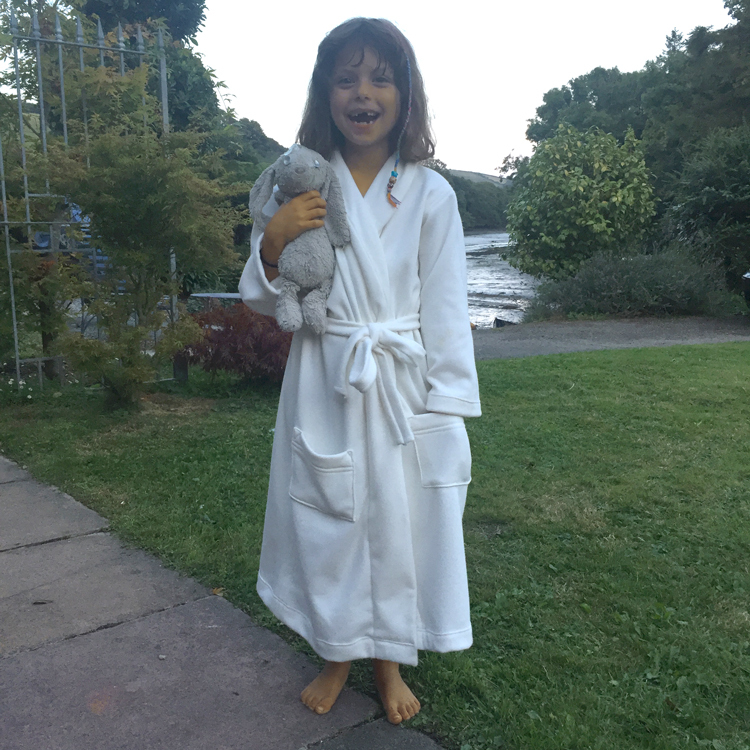 She says she hasn’t stopped wearing it – it packs well and can be dressed up or down (it even goes with slippers!). 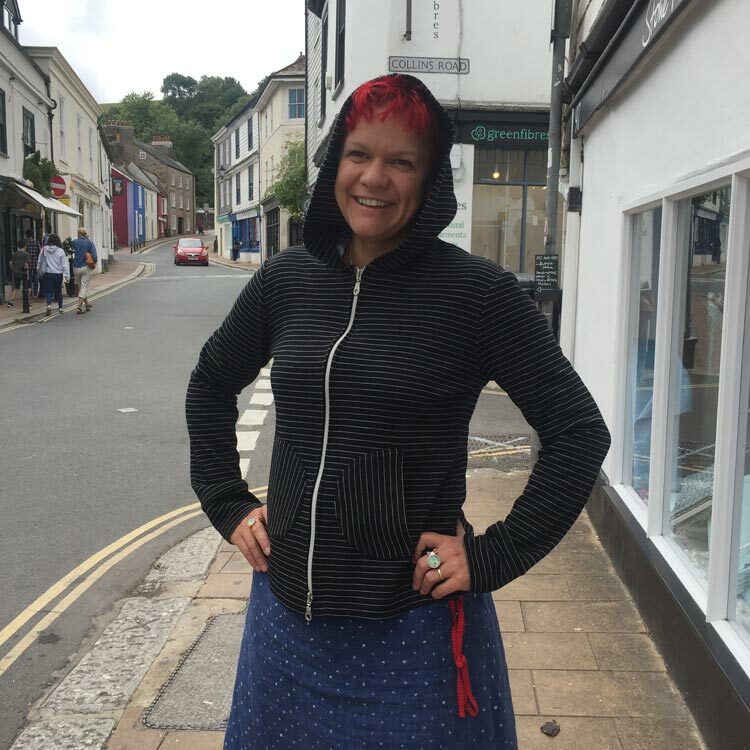 Susie terribly pleased with her spotty modal and elastane lightweight sweatshirting jersey dress -it has a great swing to it and has started Susie on a quest to find lots more jerseys with a similar medium weight like this. Watch this space! 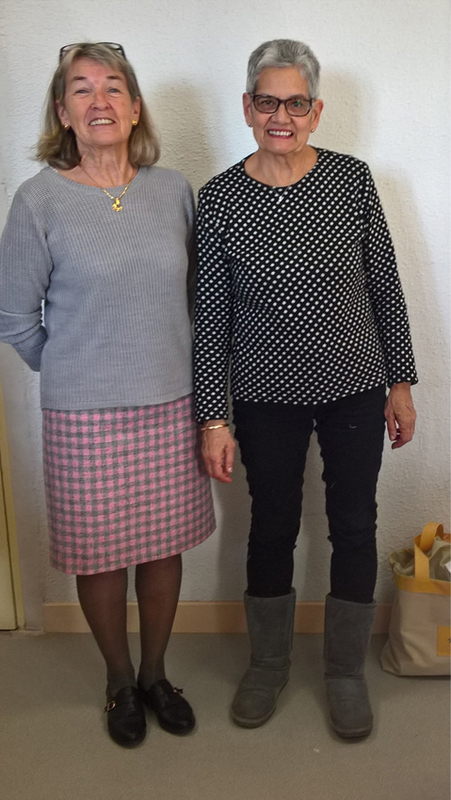 From the South of France we have the wonderfully gifted teacher, Brigitte, in her new skirt made out of pink and grey check wool tweed and Chantal in her black and white spotty heavy cotton and acrylic knit top. Bernie (not pictured) lets them look at her Cloth Club fabrics and they all add their orders to hers. Miaow and Arfur out in Granma’s garden modelling the fleecey jersey dressing gown made by Jane (granny). 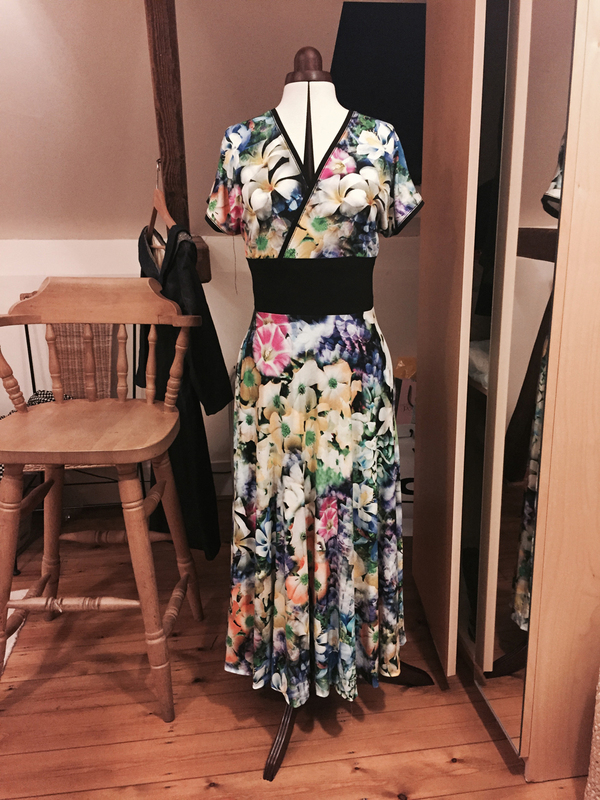 Linda was waiting in for a delivery and thought she’d make a dress for Hogmanay… as you do. So here is what she made. 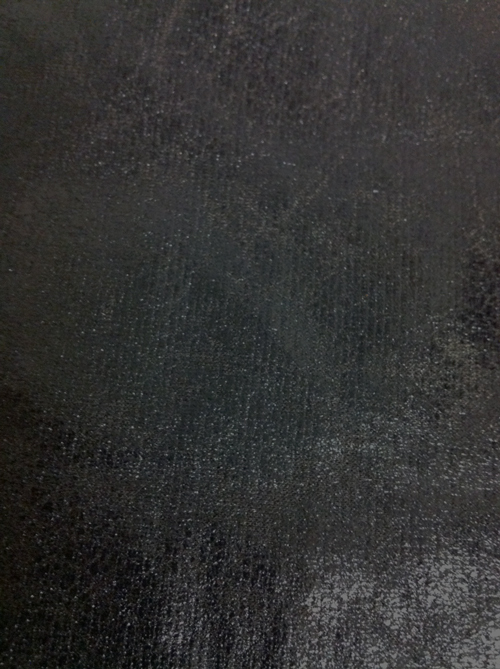 It’s a New Look 6000 pattern with the gathered side made here in stretch velour. Isn’t it amazing? 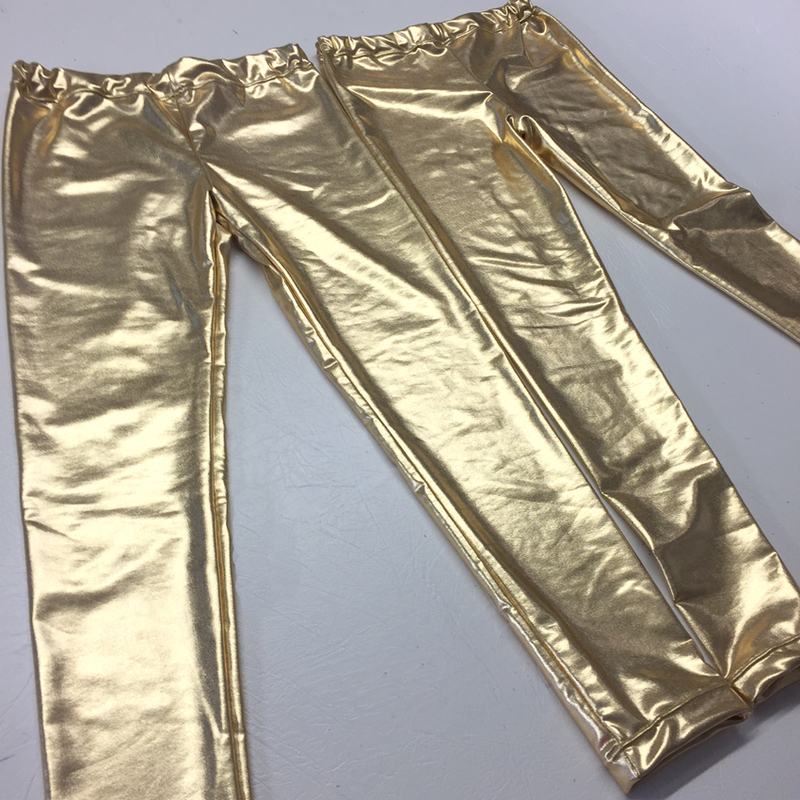 Jane made these gold lamé leggings for her grandchildren Kitcat and Miaow because every 7 year old and 9 year old needs gold leggings. Of course they do. 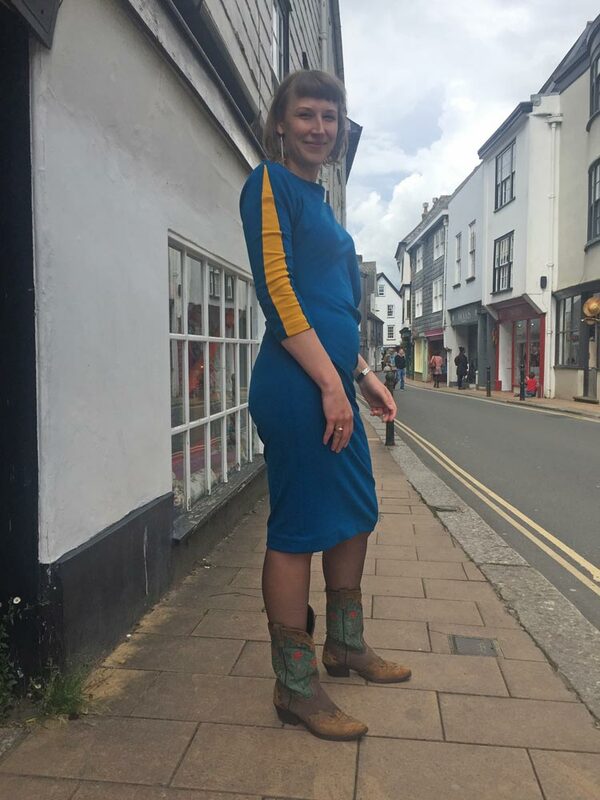 She was surprised how easy it was to sew – we don’t usually buy this kind of ‘fancy dress’ fabric, but we made an exception for this rather better quality heavy jersey with a foil finish. Sewn with a stretch needle designed for high lycra content and ballpoint twin needle. No skipped stitches! Miaow told Jane that she didn’t want her to make her school jumper because she was too slow, she wanted Bess to make it…. which was a cunning plan of a 7 year old to get granny proving otherwise. 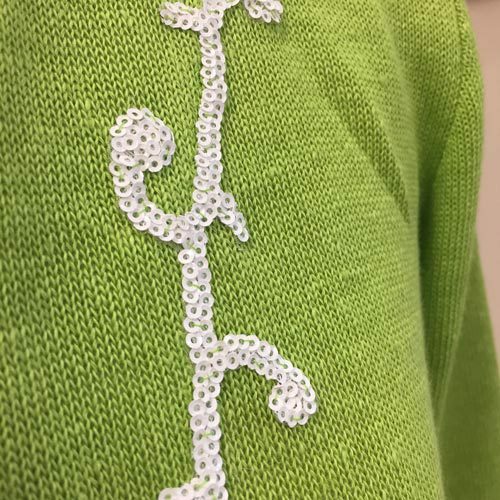 The jumper was made the very same day as the request, and in the post for her to parade around the school and stand corrected. Made with supersoft Modal, Cotton and Elastane jersey (lightweight sweatshirting) with stay tape on the shoulders. Pattern: converted from jacket on McCall’s 7044 which is out of print but there are others similar. 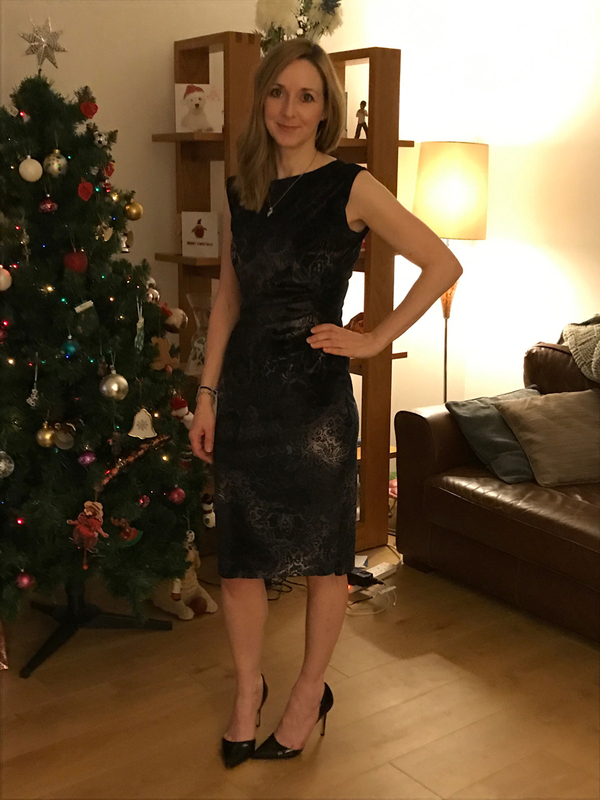 Viccy sent us this photo of her stunning digital floral print viscose jersey dress made with black contrast bindings and waist. 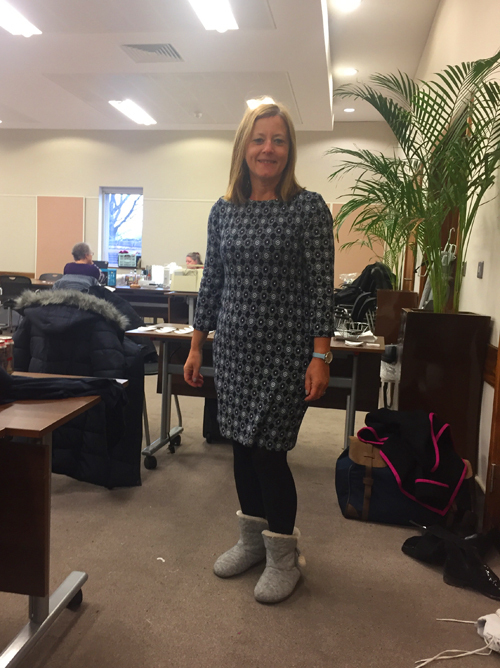 Julia (apologising for the quality of the photos) wearing her navy wool jersey cover up using Burda 6850. 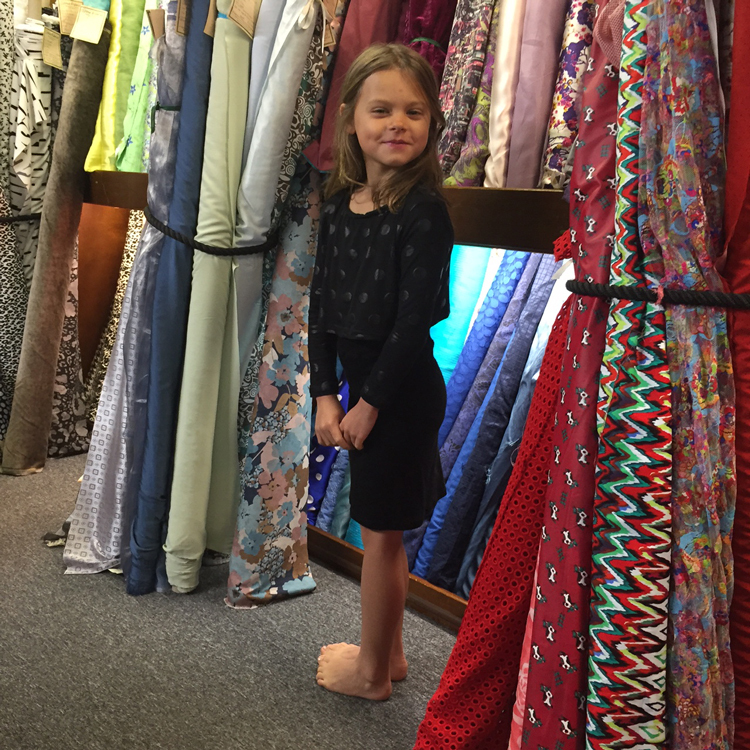 She was really pleased with both the weight and drape of the fabric. This is a really nice simple Autumn cover-up! 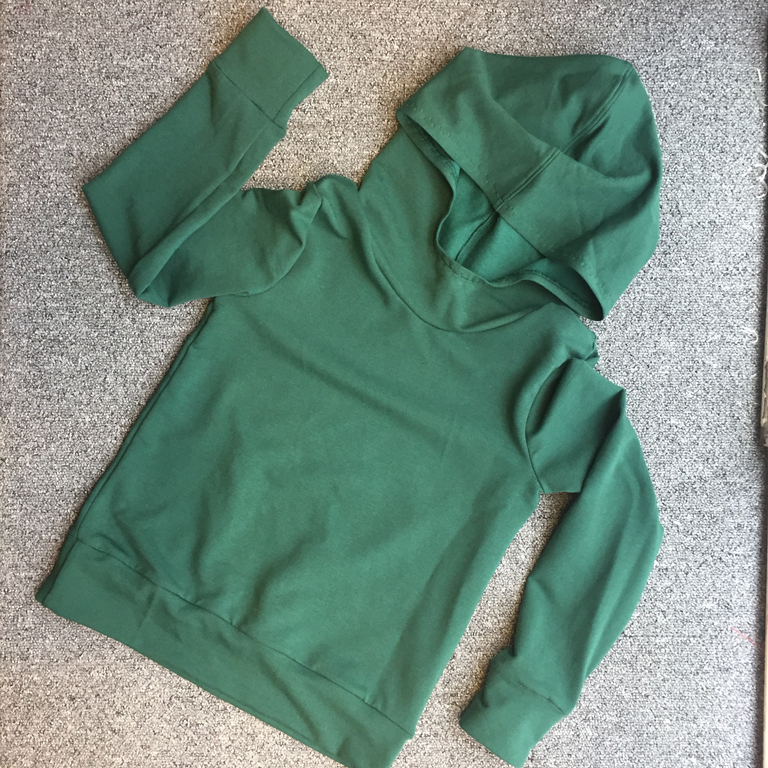 As for to the top, it is made from some lightweight organic cotton jersey and the pattern is an amalgam of several for a far too complicated reason to explain! Let’s just say it is a t-shirt! 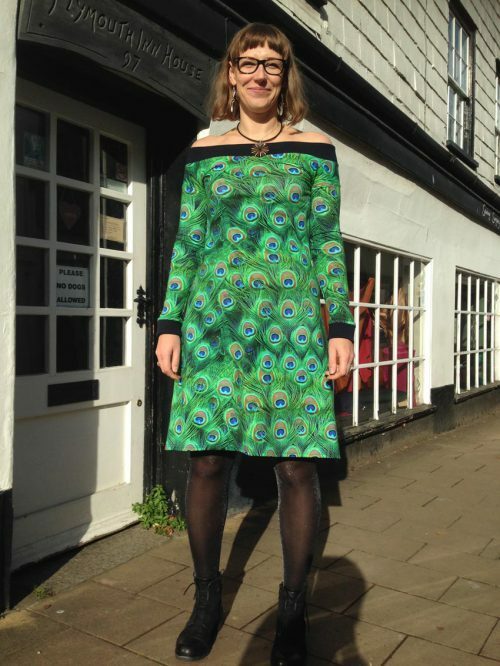 Kitcat wearing her terribly kitsch cat digital print cotton and elastane jersey long sleeved dress (made by Jane). 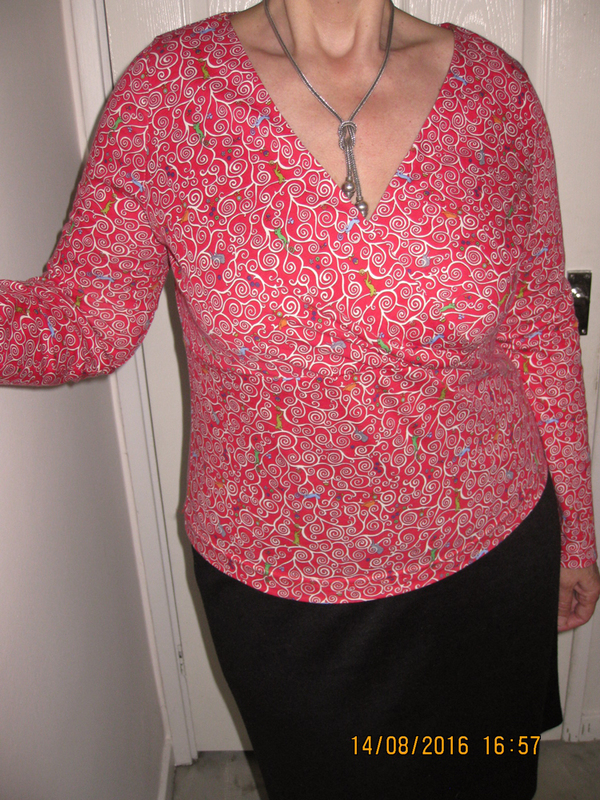 The pattern is Burda 8455 but Jane pieced together the yoke and hem so as not to cut up the print. Kitcat is such a squinge it is cut to age 6 but lengthened in sleeve and body (Kitcat is 9!). The neck was lowered so as to go over her head and negate the need for a zip but next time the neck will be altered so it doesn’t gape. Now all the grown-ups want one too. 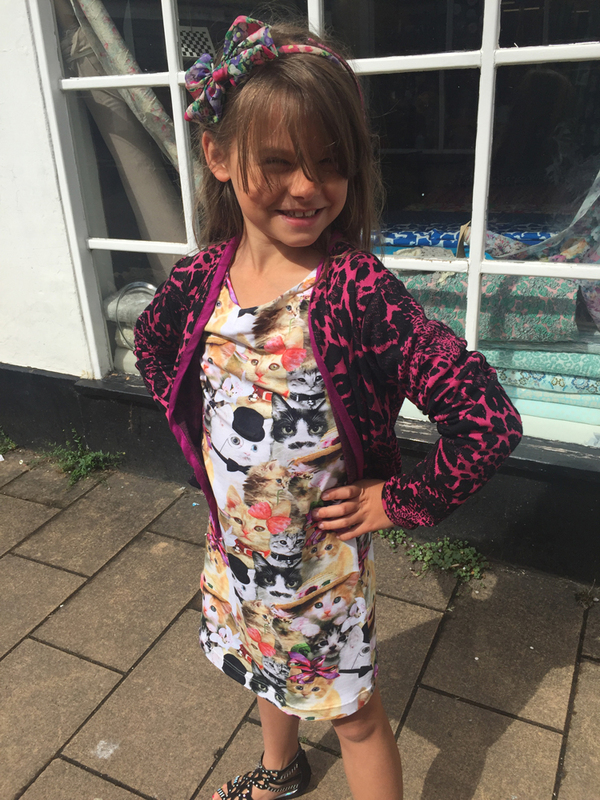 She then said that she needed pink leopard print ponte jersey cardigan to complete the outfit -personally we are not so sure this is a good fashion move but what do we know in the world of 9 year old fashion? We shall leave it to you to decide. 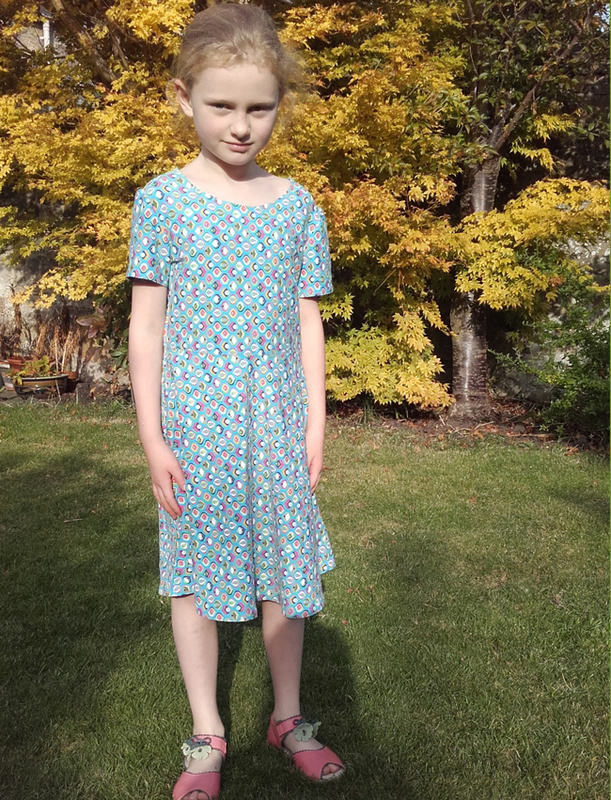 The pattern is McCall’s 6542 (age 6 with lengthened sleeves), it is bound down the front and around the neck with jersey binding. 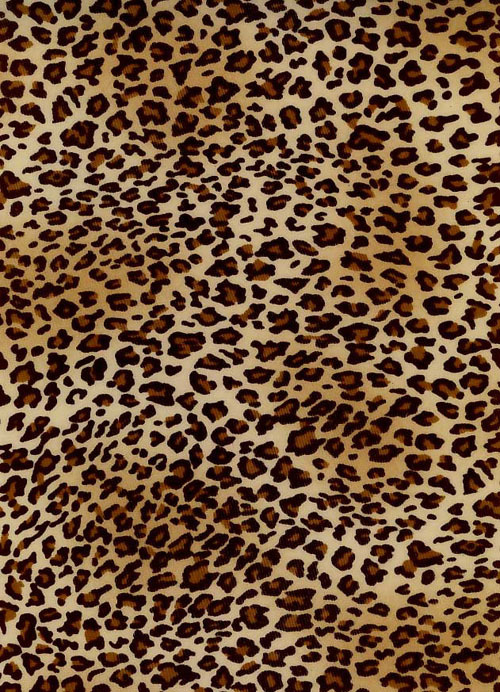 Rachel channeling her inner Bette Lynch in this leopard print scuba jersey wrap skirt. 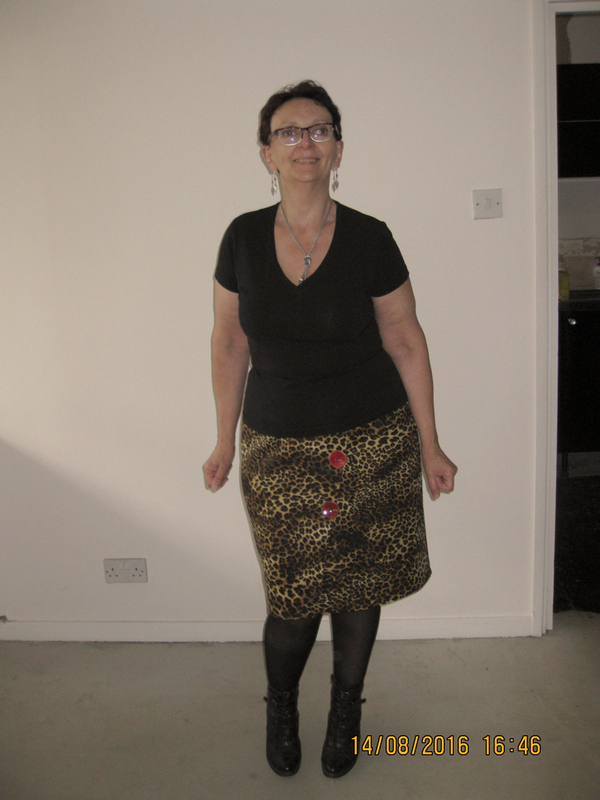 The pattern is Simplicity 1322, large lacquered coconut buttons were added for fun and modesty -the skirt makes her feel quite saucy with the open wrap front (which is a good thing). 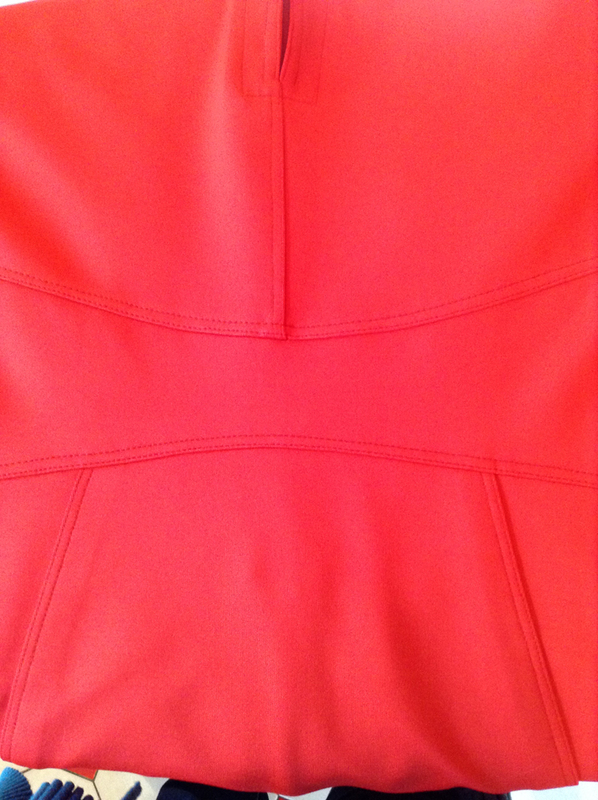 The skirt is lined in Red Venezia. 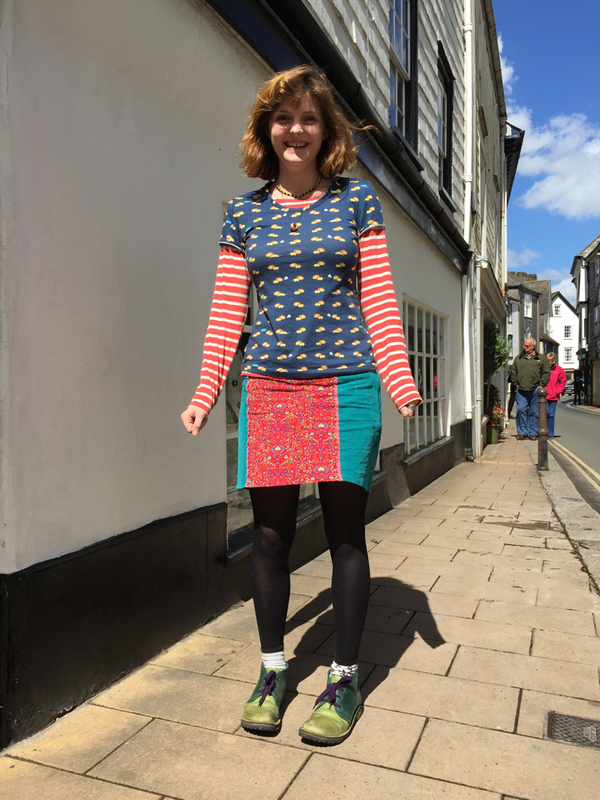 Rachel with her red Liberty printed cotton jersey wrap T-Shirt. 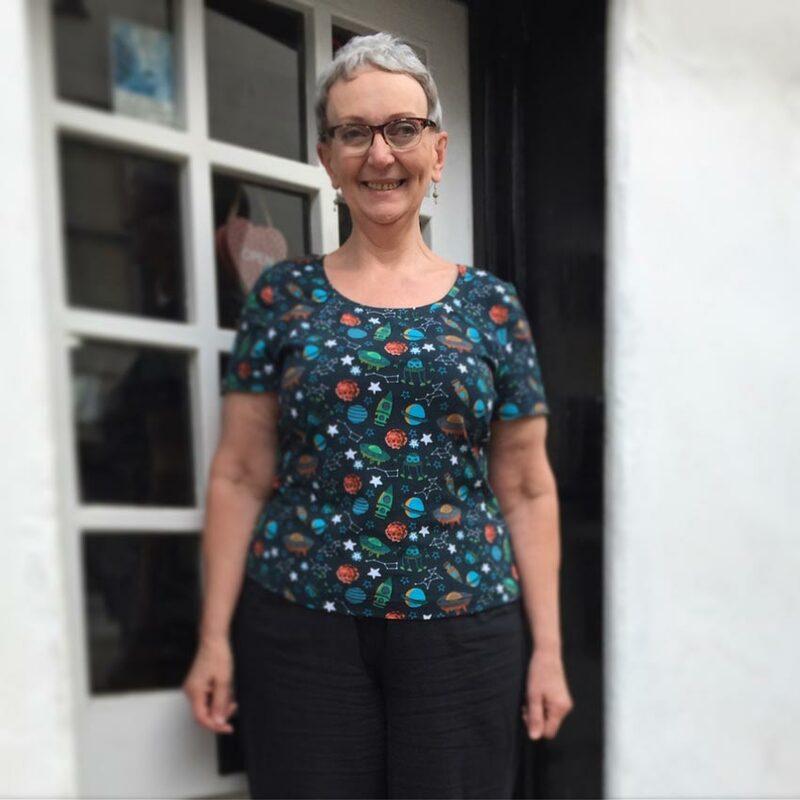 The pattern is Butterick 5084 and works equally well in a stretchy viscose and elastane mix jersey as this pure cotton jersey (and also heavier cotton and elastane jerseys too). 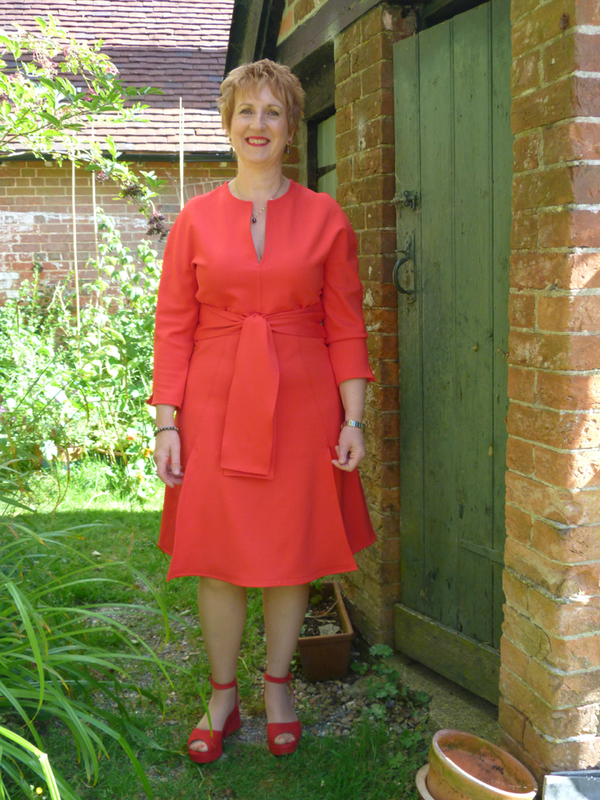 Jacoba triumphant in her Chado Ralph Rucci dress made up in red scuba jersey, she said it’s been great to do some sewing again. The (minor) changes made to the pattern were raising the front slit by 2 inches, omitting the front panel pockets (didn’t want the extra bulk), and also slightly changing the curve on the shoulders. She said the jersey was remarkably good fabric to work with. Huzzah for that top-stitiching! 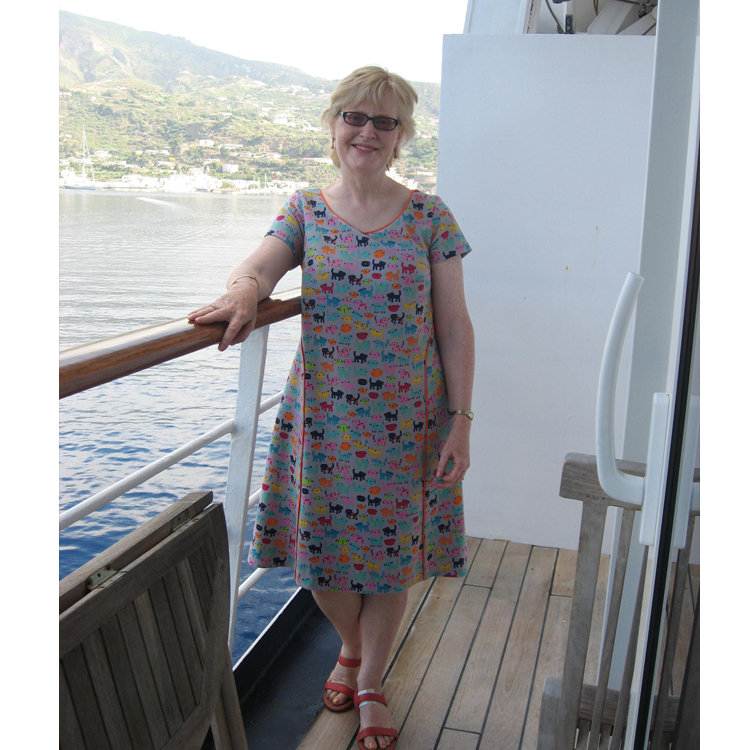 Marion on her silver wedding anniversary cruise wearing her fun and easy cat print cotton jersey dress designed and made for her by the genius Dawn Hooper of Hardy and Hooper (Maidenhead). 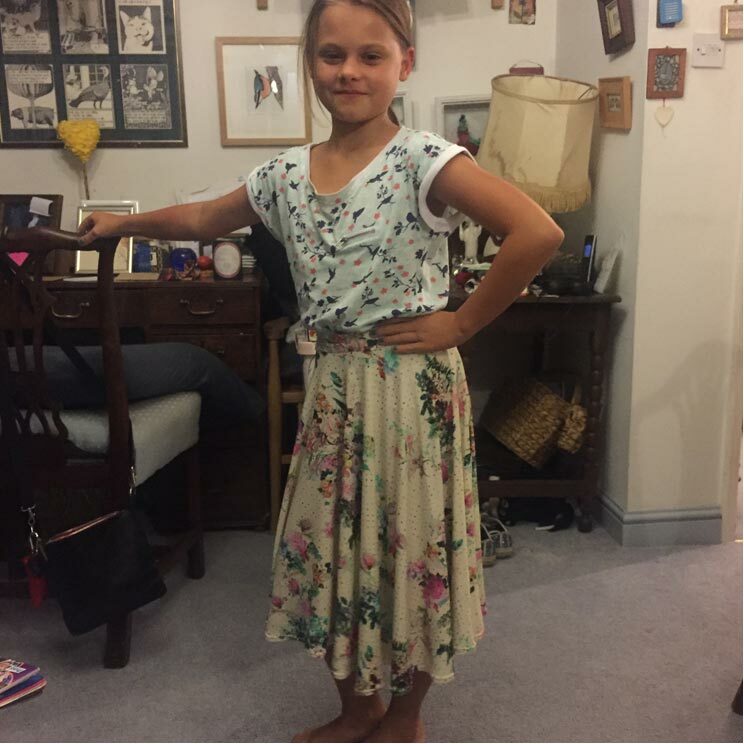 Daiga made this floral digitally printed viscose jersey up into a fabulous dress for a 6 year old using simplicity 1146. 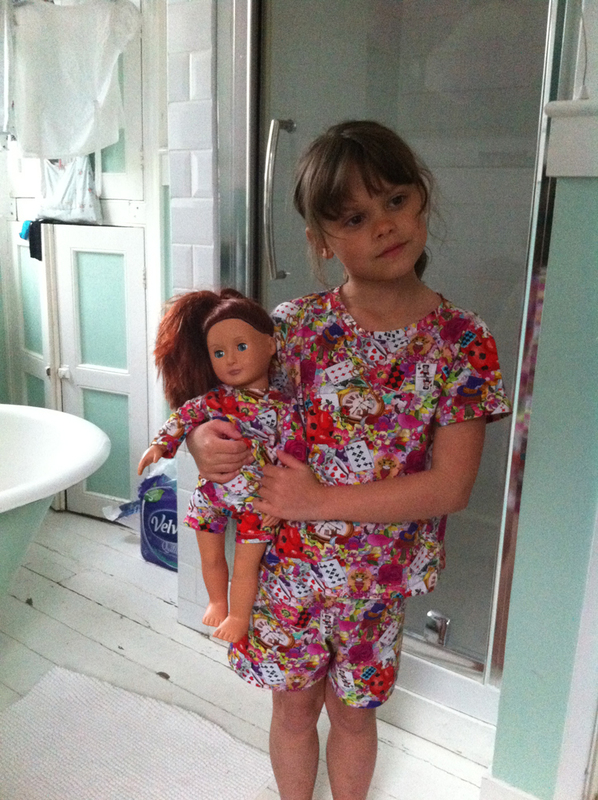 The neckline is embellished with diamanté (what little six year old doesn’t love a bit of bling? And what mother doesn’t love a dress that can be screwed up into a little ball but still looks perfect when worn? 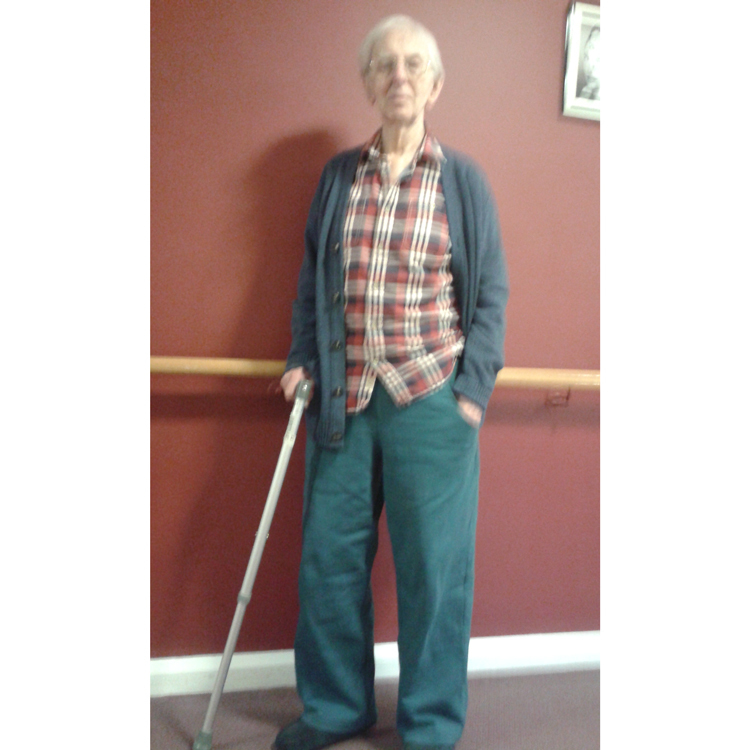 Bryan looking terribly dapper wearing his machine dyed cotton sweatshirting trousers made by Rachel. They have extra deep pockets for stashing various things that a man needs whilst still having hands free for the zimmer. Genius! 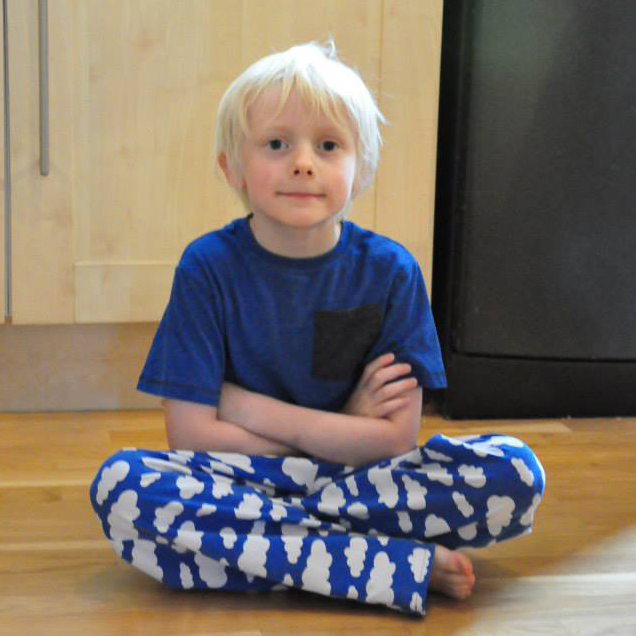 Dyed using Dylon machine dye (denim blue), the waist has elastic with a drawstring at the front. 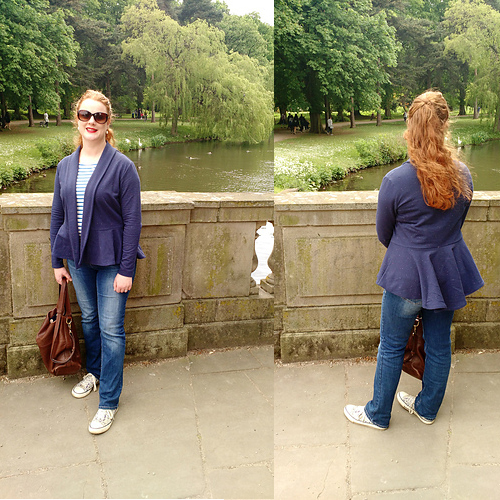 Bree was pleased as punch with this jacket she made in record time entirely on her sewing machine (no cheating with an overlocker), it is a blue cotton sweatshirting with multicolour flecks, she used McCall’s pattern 6844. FABULOUS! 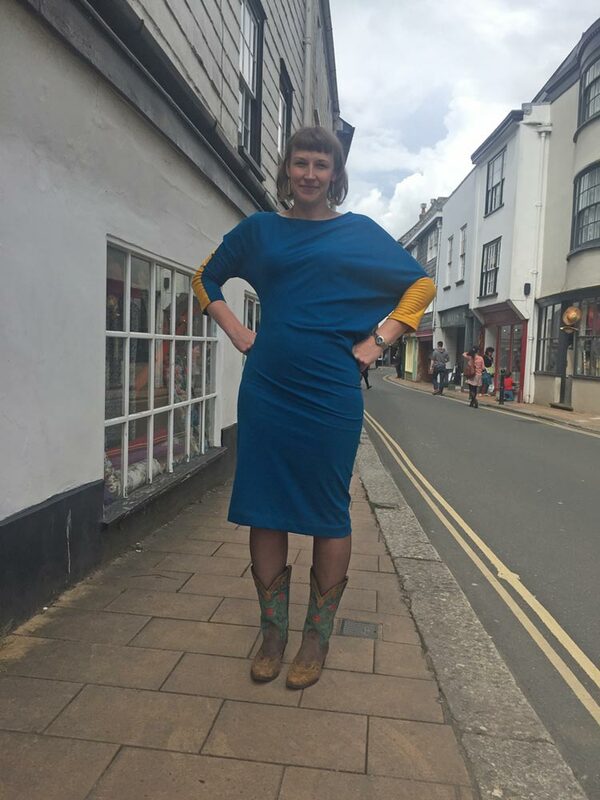 Eloise modelling her bright blue jumbo cord dress with jersey circle inserts and inseam pockets. Made by Aunty Bess who would really like one for herself but suspects she’s too big. Kitcat and Miaow with their Alice in Wonderland print cotton jersey nightime ensembles (complete with matching nightie for Ayla the dolly.). Made by Jane, who doesn’t at all spoil her grandchildren. 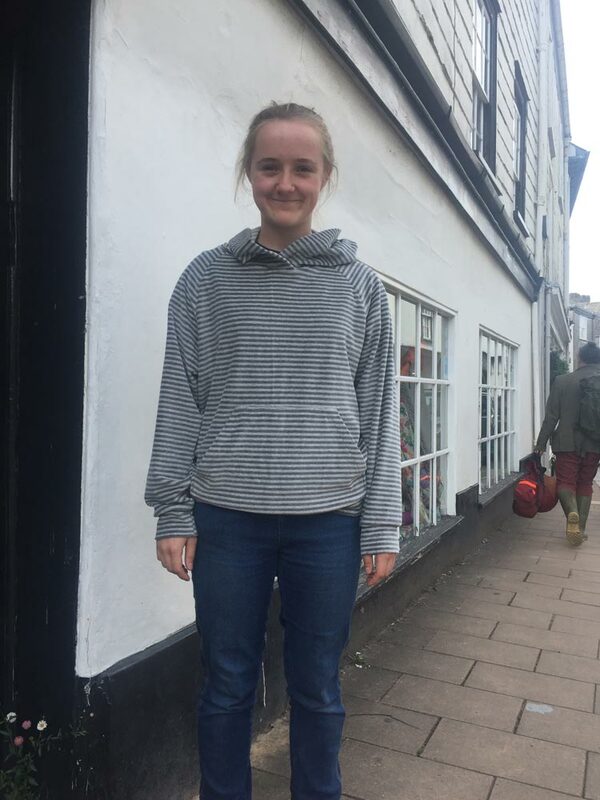 Vanessa came to the shop with this Fraser sweatshirt (from Sewaholic), made with a reversible cotton sweatshirting so the stripe contrast shows on cuffs and neck binding. It is super warm and comfy (not to mention stylish). 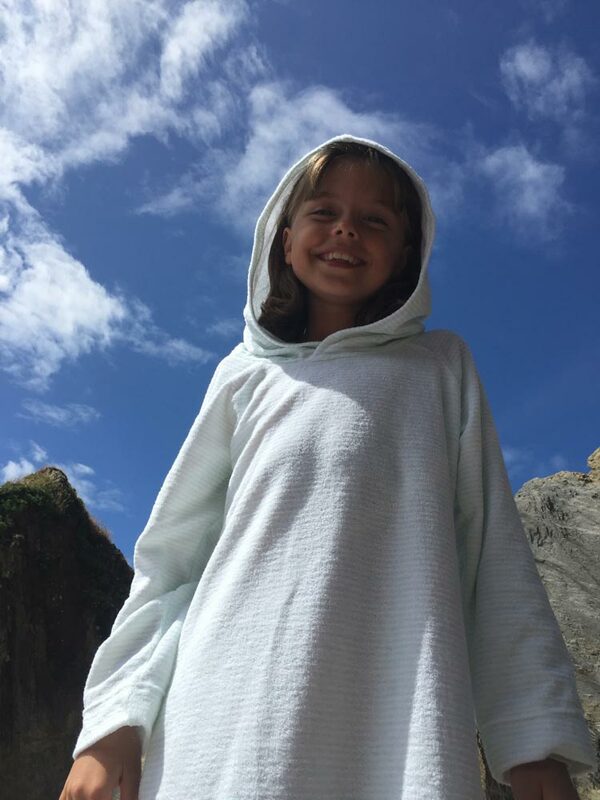 Bess wearing her hoody tunic in ivory sweatshirting on top of the South Devon Cliffs on a brisk April walk. 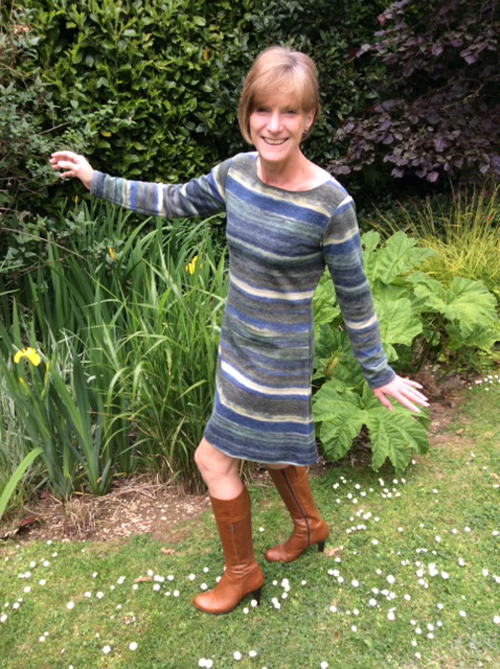 Bess used Vogue 8951 pattern and added grey stripey cuffing. School shirt made for Miaow (by Jane) with white cotton seersucker using Burda 9744 pattern. 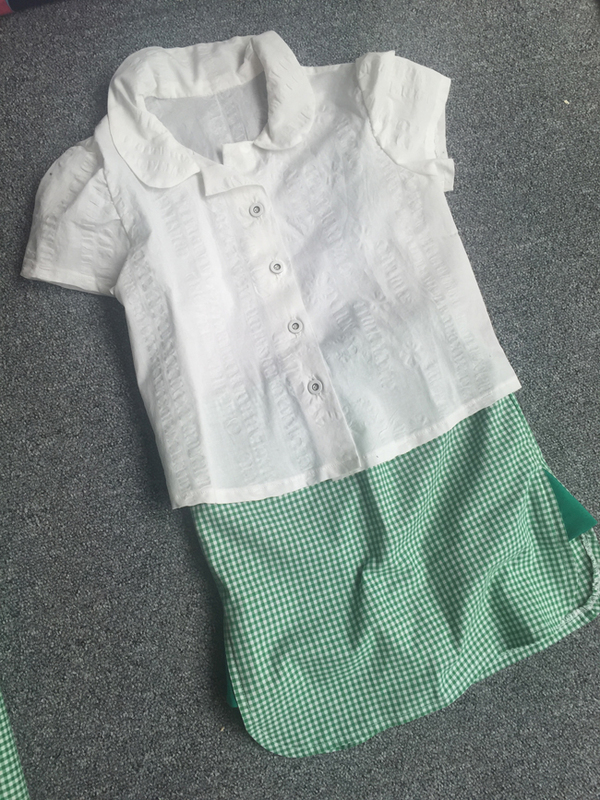 Green gingham cotton skorts (The shorts bit underneath is green cotton and elastane jersey) using MCall’s 6918. 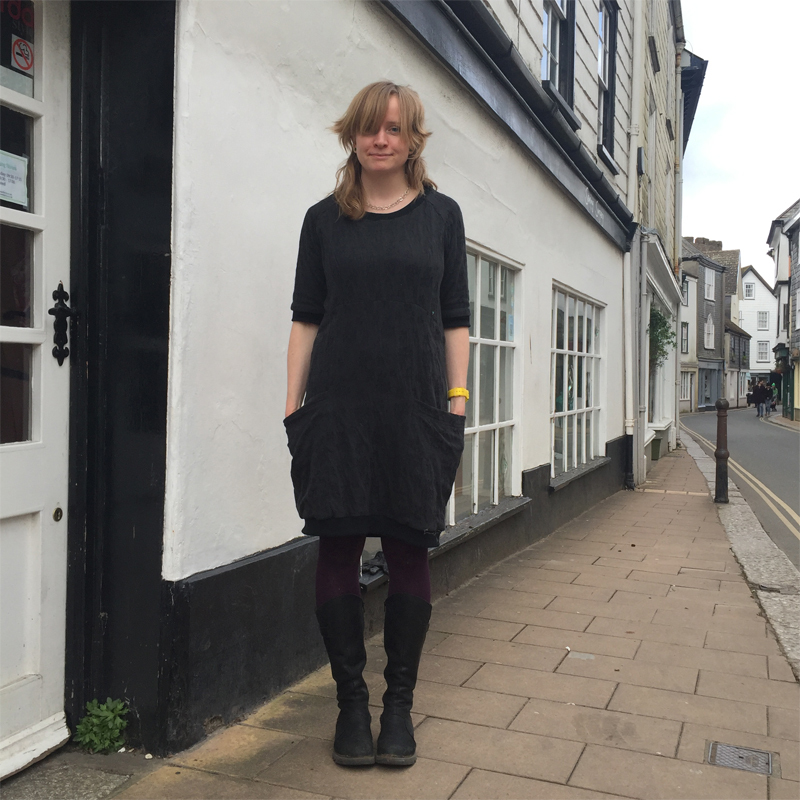 Kate outside the shop wearing her Grey Cotton mix jacquard jersey ‘Lola’ dress made from a Victory pattern. 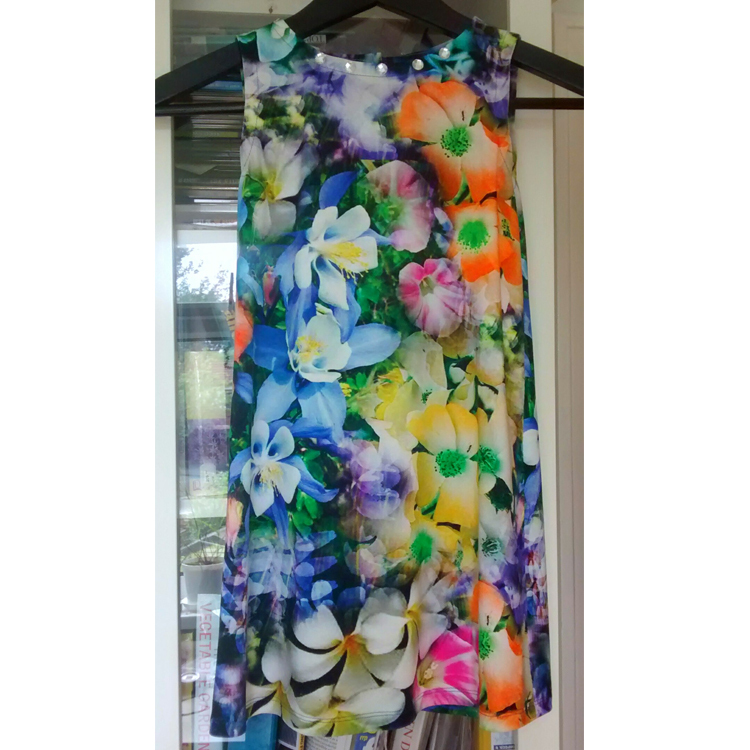 It has fabulous deep pockets that go all the way round the side seams. 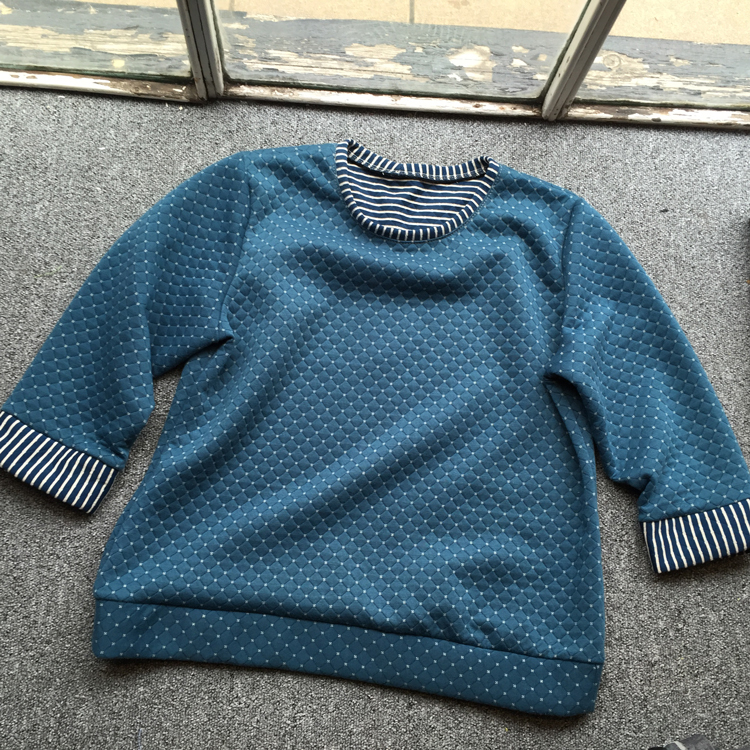 The neck, hem and cuffs are all finished with cotton ribbing. 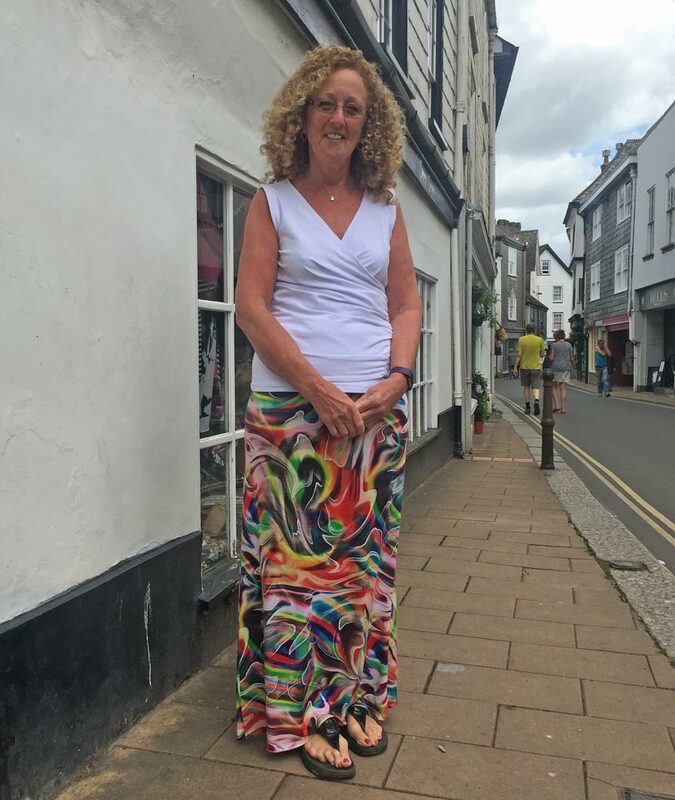 Jessie wearing black and multicolour alphabet print viscose and elastane jersey T-Shirt made by Bess for her Christmas Present (has been worn to death since!). 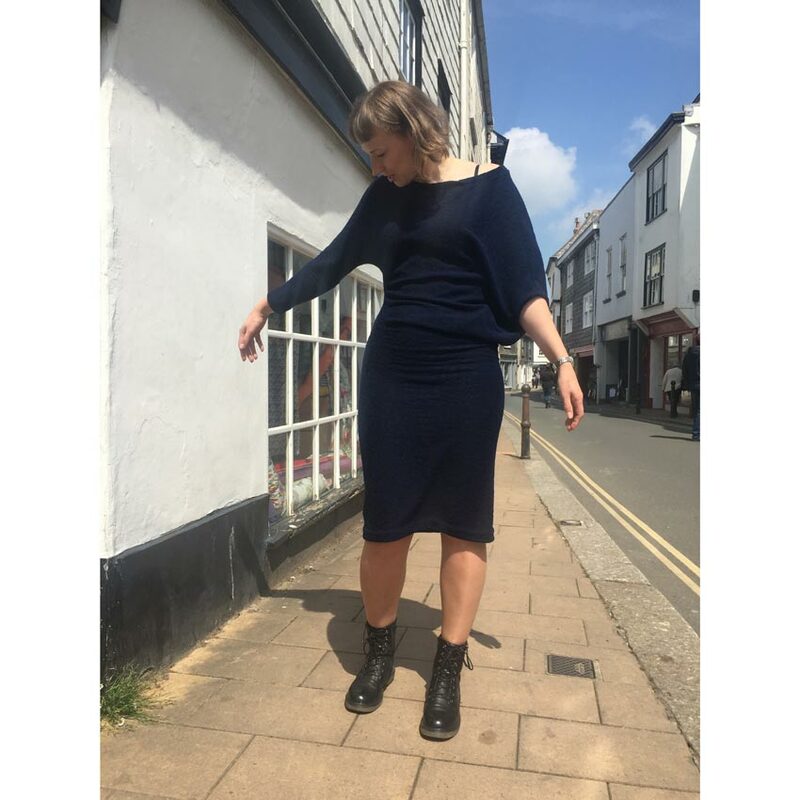 The pattern was taken from a favourite Jaeger Breton T-Shirt so it was designed for heavier interlock type jersey but works very well in this slinky viscose jersey. The square neck is interfaced with extra-light iron on interfacing H0019 and the back neck and shoulder seam has a stabilising tape sewn in so they do not stretch out of shape. 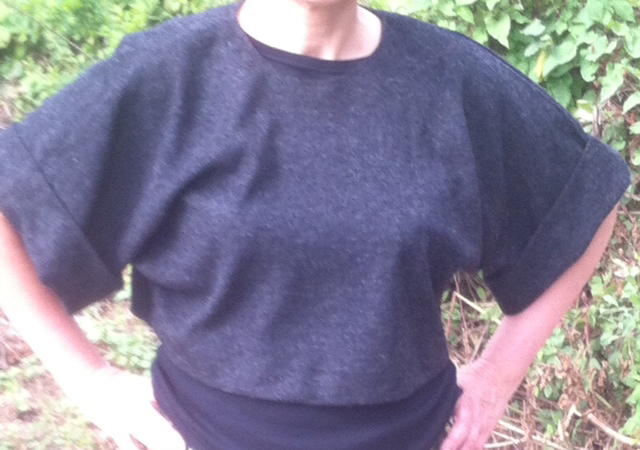 Bess made this uber-simple top using loopback sweatshirting from an old favourite Vogue t-shirt pattern. She bound the neck in self fabric and hemmed with a simple zigzag stitch. 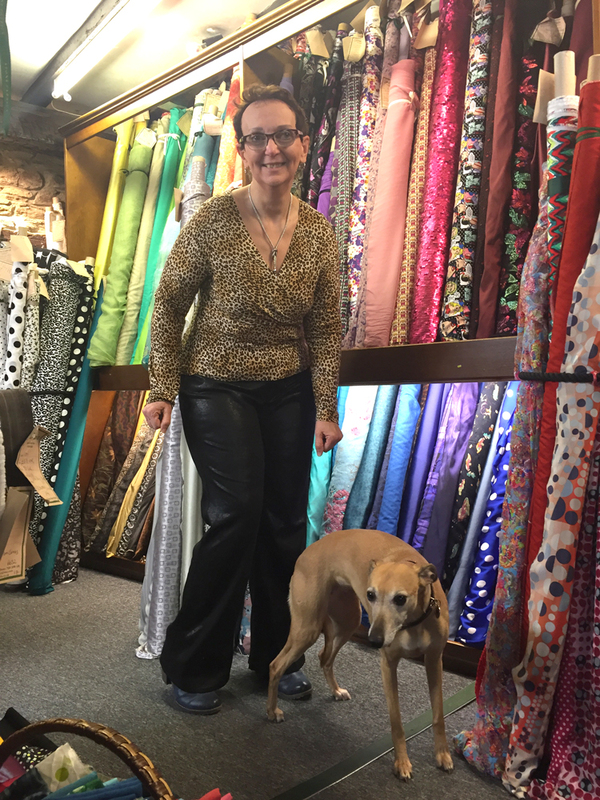 Rachel (with her whippet who knows she’s not really allowed in the shop) wearing black leather look ponte jeans (beautifully made) but not fitting brilliantly*… prototype #2 coming soon, and slinky dink leopard print poly jersey mock wrap t-shirt. 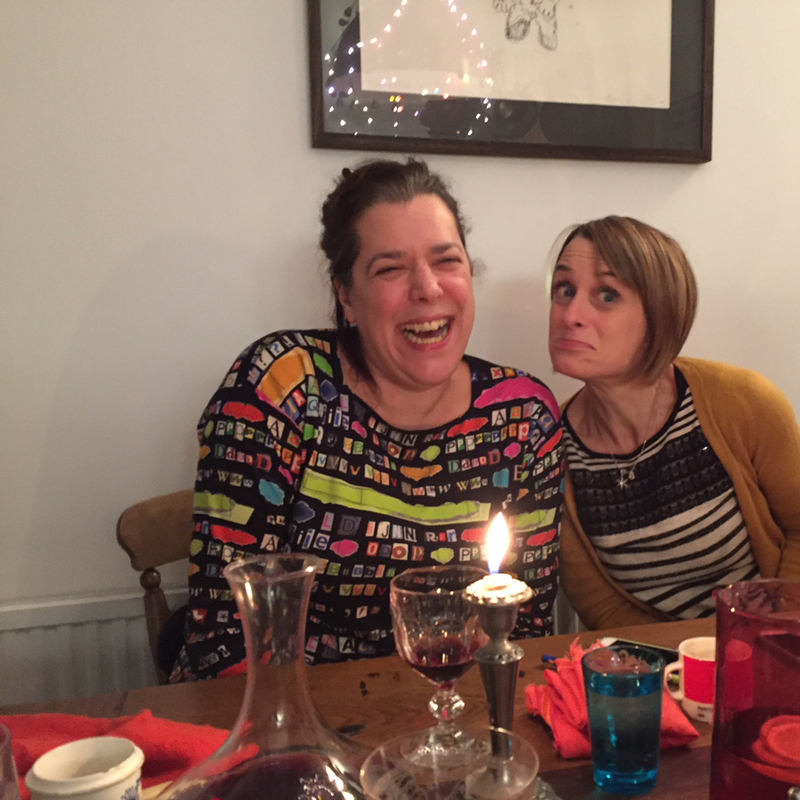 She does love a bit of Kitsch, does our Rach, and this is definitely in the kitsch camp! 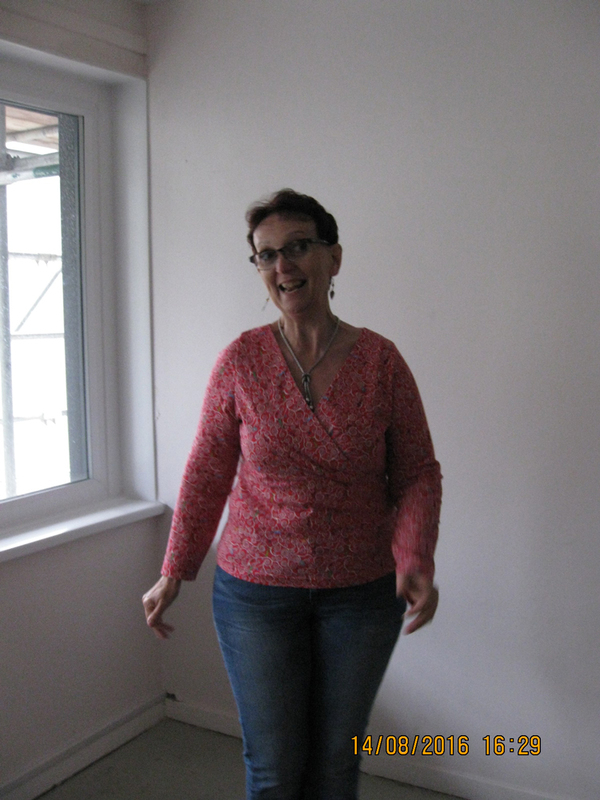 The Jeans are butterick 5682 (not designed for jersey hence the fitting issues) and the top is Burda 6848. *Actually we think they fit pretty well but Rachel likes perfection. 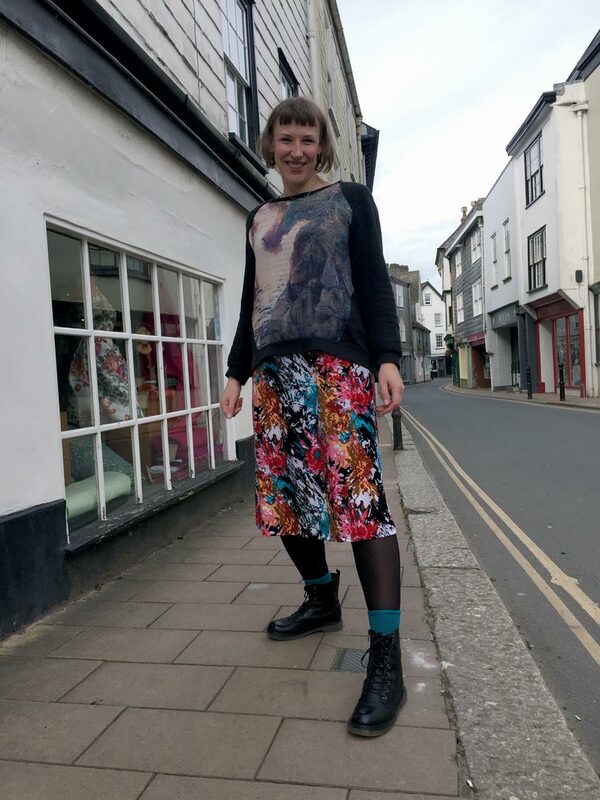 Rachel with her kitsch cats print cotton and elastane jersey mock wrap t-shirt made using Burda 6848 pattern (with minor alterations to enable a good fit) and black leather look ponte jersey skirt. Kitcat wearing her black jersey skirt and cropped T-shirt which she made HERSELF. Jane helped (with hyper alertness) as Kitcat was burning along at break-neck speed with the overlocker. There is probably a really important life-lesson learned here but we are not quite sure which it is, or for whom. Meanwhile, Kitcat has a fabulous outfit to pretend she is 18 in, and Granny still has all her fingers. 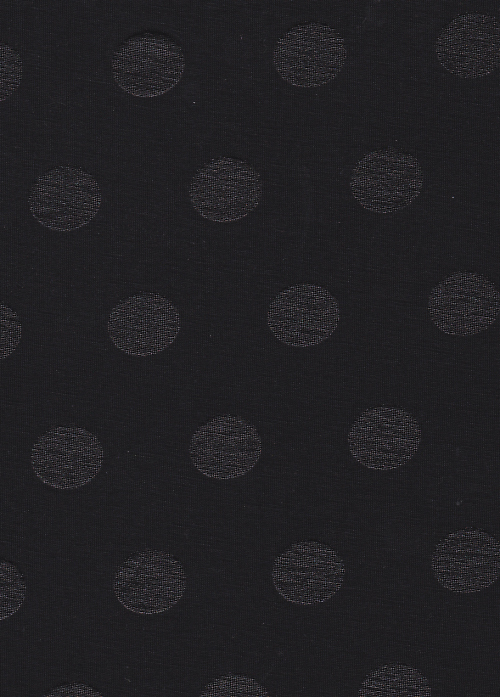 The fabrics are both viscose jersey, one heavier and slightly textured for the skirt and a lightweight polkadot print for the top. 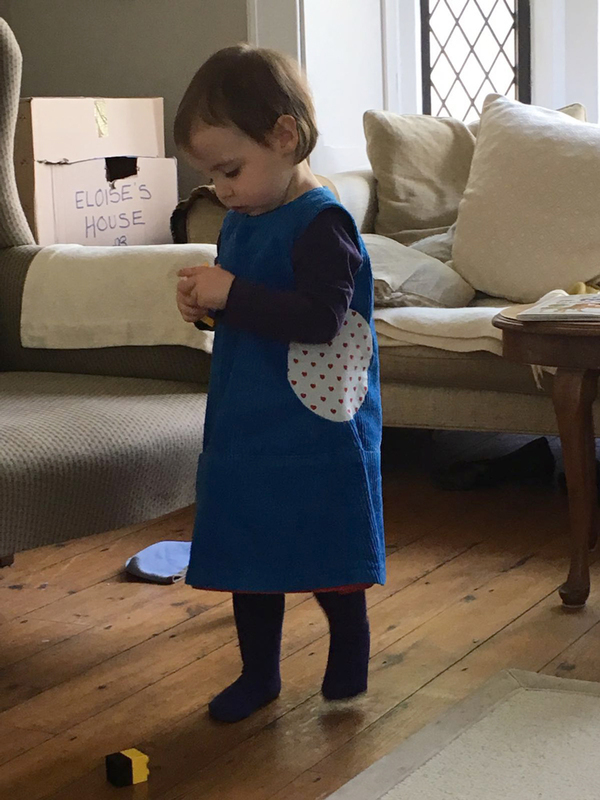 Frances made this dress for her grand-daughter to go to the school Oscar awards. 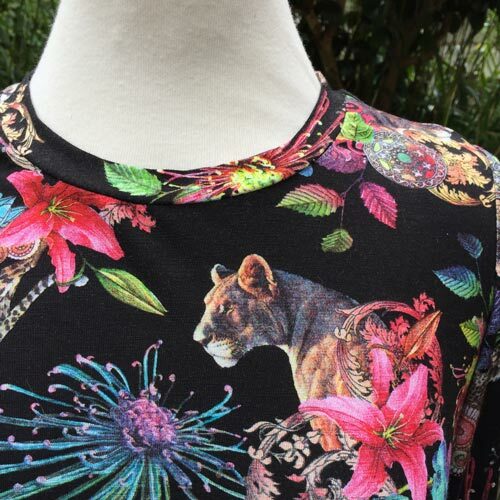 It’s an easy pull on dress using McCall’s Pattern 7079 and made with a t-shirt weight cotton and elastane single jersey. 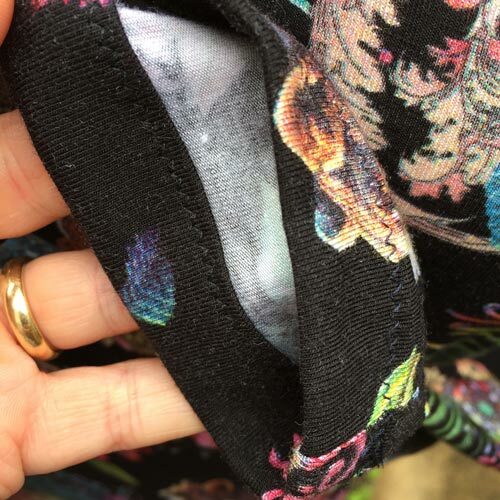 It’s a good idea to stay the shoulder seams with a bit of tape on t-shirts and dresses, you can use a seam tape, iron on a bit of stabilising interfacing or even sew in a bit of the jersey selvedge (if it is stable enough). 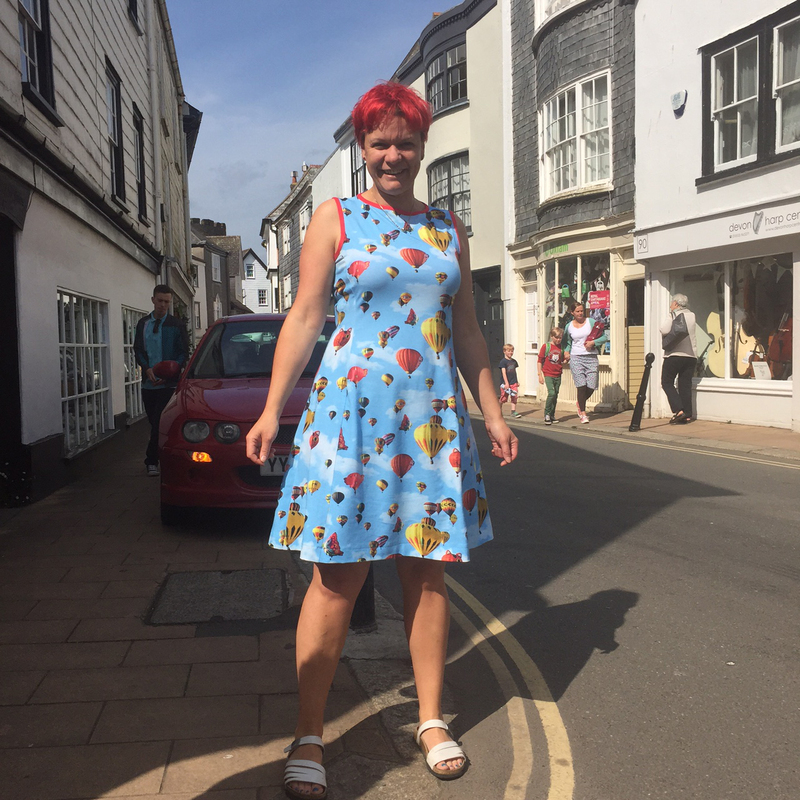 Bess wearing her digitally printed cotton jersey dress made using her (much repeated) panelled dress pattern-this normally has waist seams but she omitted them so as not to cut up the balloons too much. As the pattern is normally used on woven fabrics she also pinned out the little bust darts as they were unnecessary in this stretchy fabric. This jersey is quite a heavy cotton jersey with a high percentage of elastane (6%) so it keeps its shape well and doesn’t need lining. Rather than meddling with facings (which never lie terribly well in such a stretchy jersey) Bess used jersey binding around the neck and arm holes. All the seams were sewn in a jiffy with the overlocker, the hems and bindings were done on the machine (because it’s quicker to zigzag than drag out the flat locker). 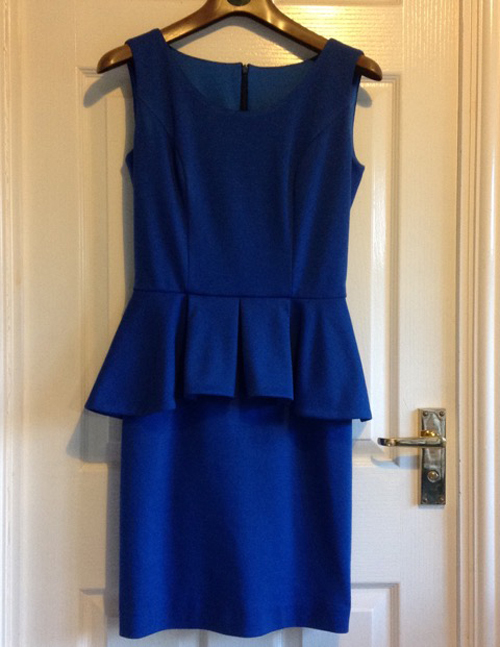 Lesley made this ultramarine blue Ponte Roma jersey dress with a peplum. 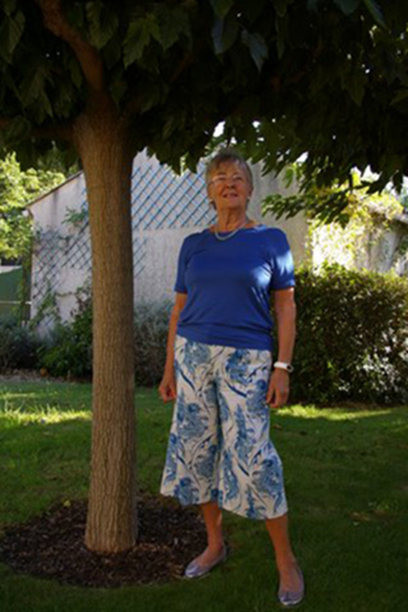 The pattern was Simplicity Project Runway 1650. 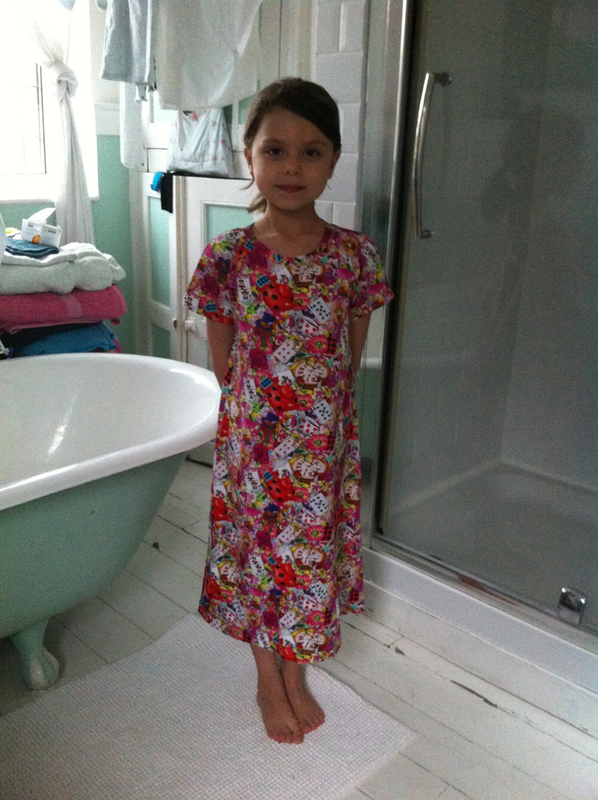 This pattern wasn’t lined, but she preferred a fully lined dress so did it with a polyester Tricot (knitted) lining. 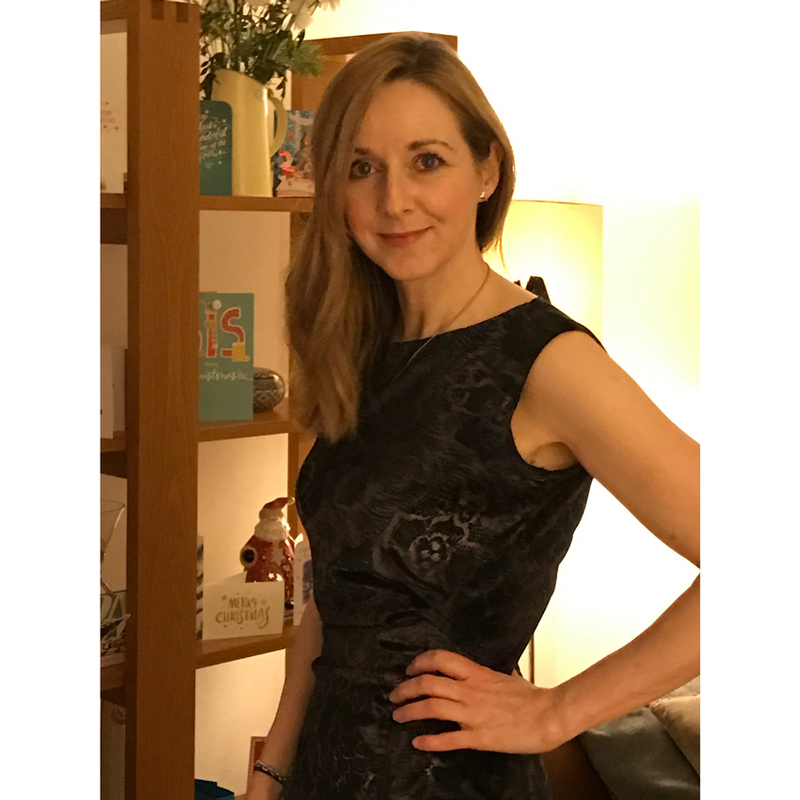 Lining a dress like this gives it a more professional finish as it meant the armholes and neck could be under-stitched so the stitching is not visible on the right side. She also lined the peplum rather than just hemming it (as per the pattern) to get a better finish. 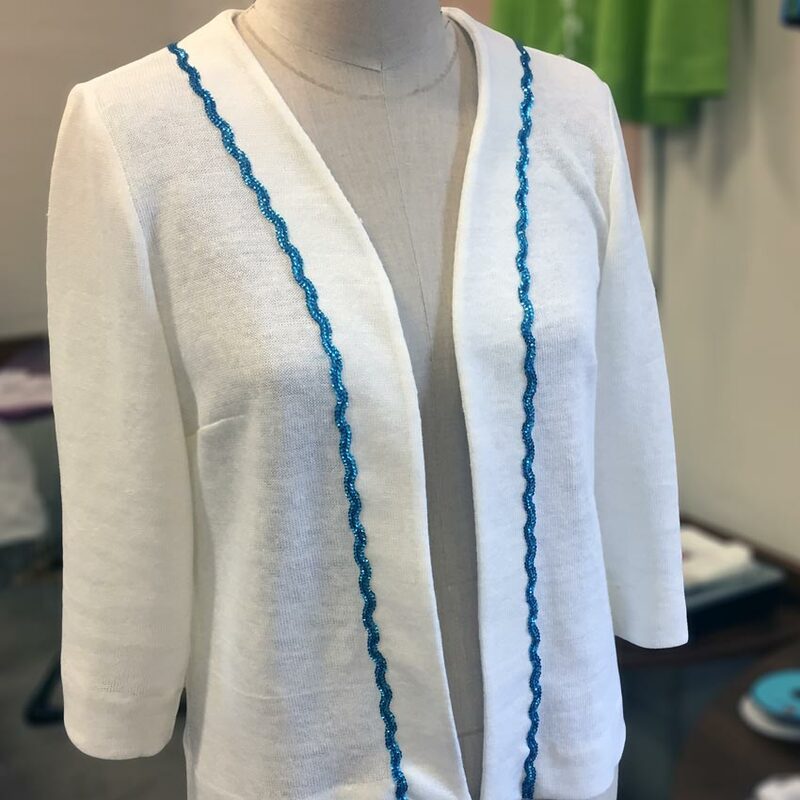 Ponte Roma jersey is not that stretchy so an invisible zip is used at the centre back which she tacked -something she hasn’t done for years but so worth it to set it in evenly on a stretch fabric and to make sure that seams lined up perfectly. 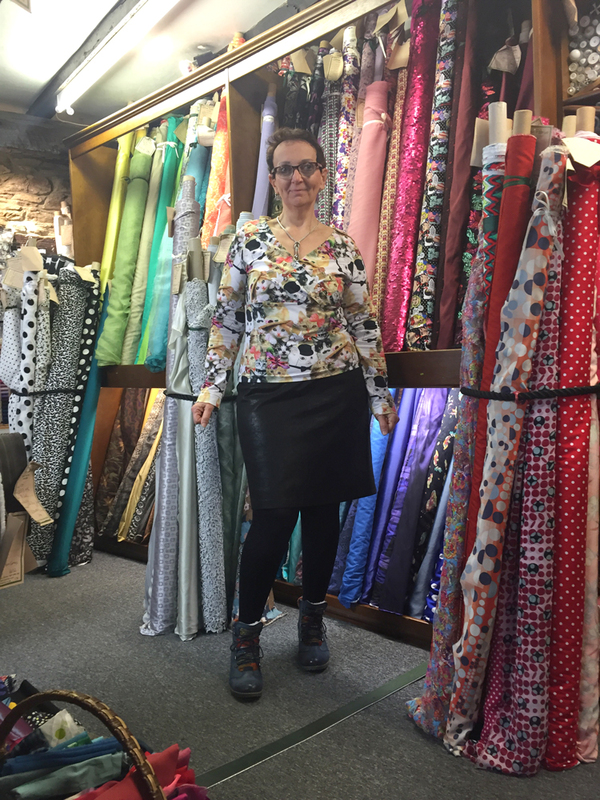 The Ponte fabric was lovely to sew; for anyone not comfortable with sewing jersey or stretch fabrics it is a good place to start. 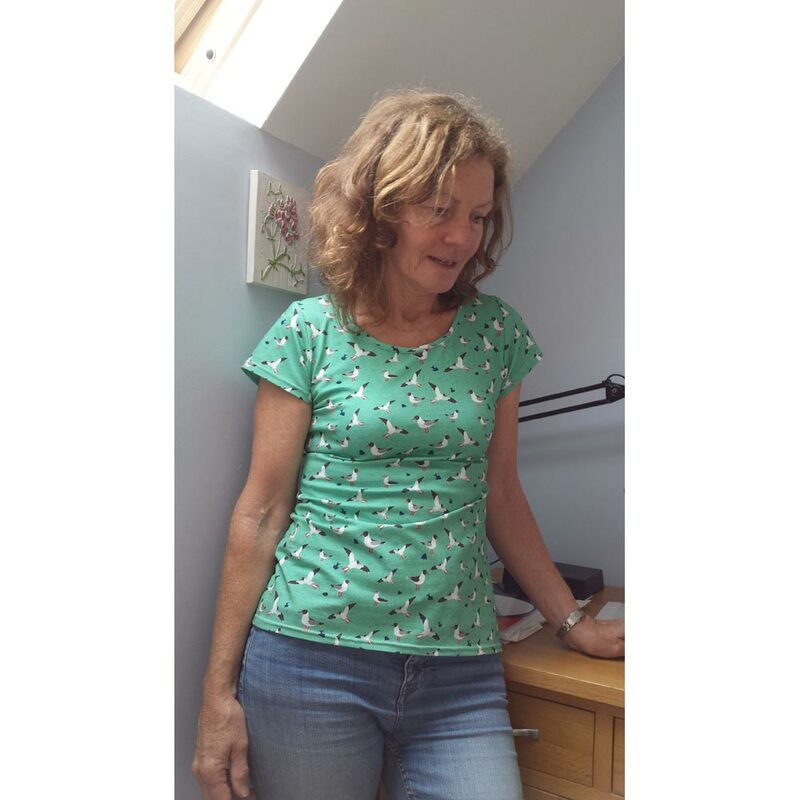 Elwen wearing her lion print cotton jersey T-Shirt using the Burda 6820 pattern. 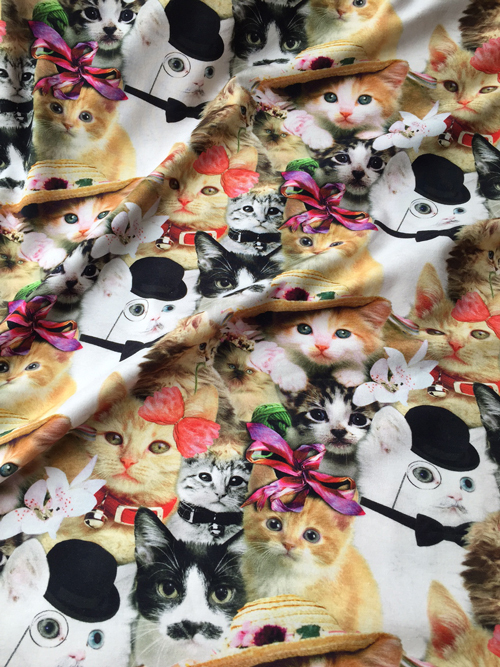 I’m pretty certain this print is more effective at cheering oneself up than any prescribed drugs, she was definitely very pleased with herself the day she came into work wearing that. Worn with a panelled mini skirt made using remnants of cotton needlecord. 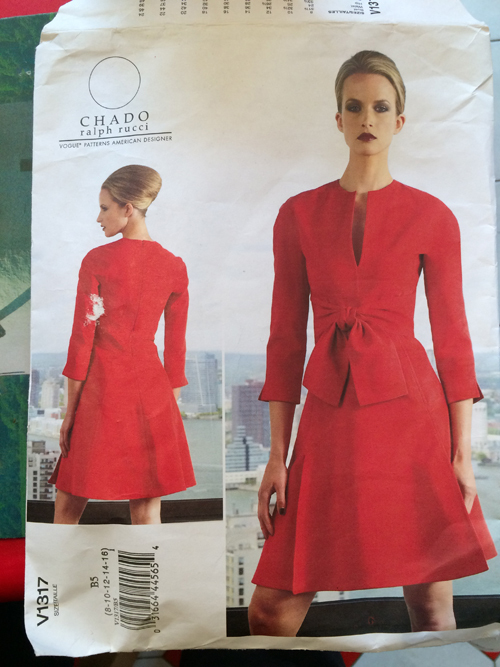 The pattern is Burda 6928 and is a great user upper of remnants! 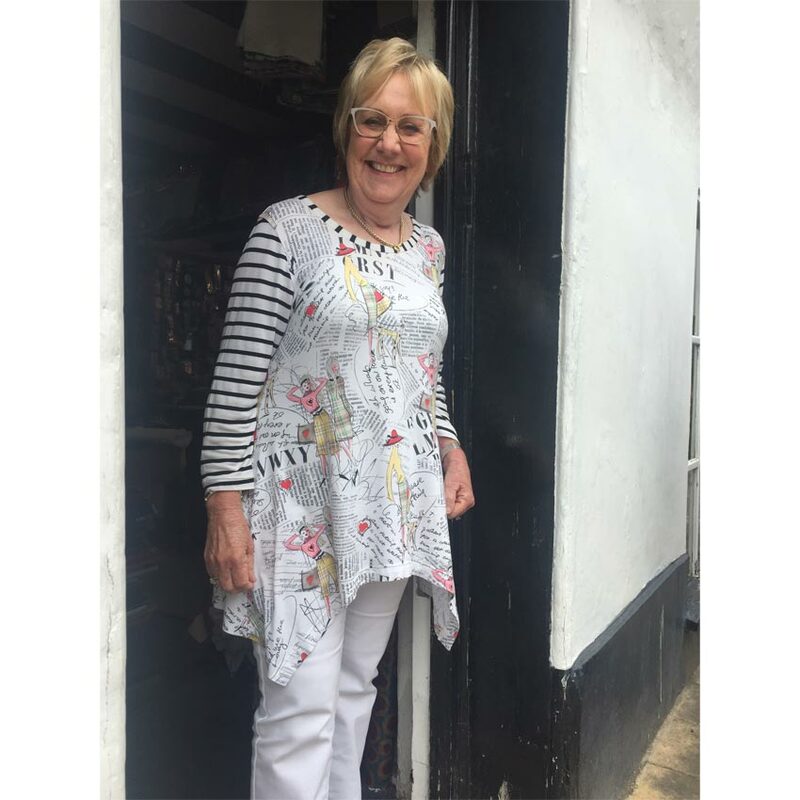 Jan made up this brilliant “Coco” dress (from Tilly and the Buttons) using an acrylic mix double jersey printed with an irregular abstract stripe. This jersey has only a little stretch in it – much like a Ponte Roma jersey. We love the way she has managed to match those stripes at the side seams despite the irregularity of the stripes. Very Clever.